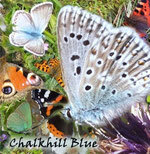 Please feel free to contact me if you'd like to see any corrections - Chalkhill Blue makes no guarantees as to the accuracy of any of these IDs, and does not accept any responsibility for any harm or damage you may incur by accepting them as gospel! It was lovely and warm and sunny on Saturday and British Summer Time officially started overnight, but it’s been going downhill again ever since. This morning it was overcast and cold; it rained in the afternoon and got colder still. A bit of a birdy day today though; I saw the year’s first swallow flying high overhead as I approached the factory gates at 7:00am. 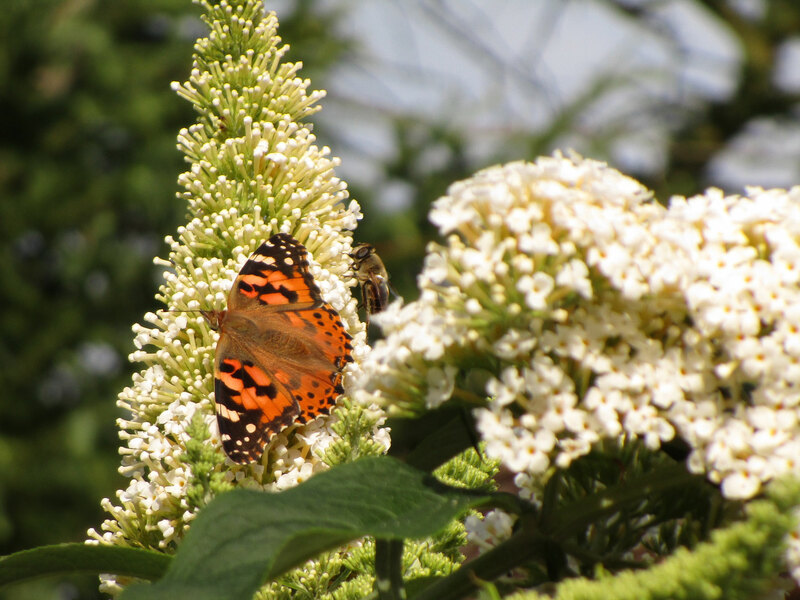 It did not a summer make, but was flying purposefully straight in a westerly direction. Then on the way home, I paused at the top of Church Walk as a great spotted woodpecker swooped low into a tree I had just passed and commenced attacking the branches with short, digging motions of its beak, sending woodchips dropping on to the path. As I watched, another one landed up at the top of the same tree, near to where a goldfinch was slowly edging along the branch. It might be the best view I have ever had of a spotted woodpecker, but of course today was the day I had forgotten my camera. No matter, the light was a bit dull to get a really good shot anyway, but I stood and watched both of them for a fair while, listening to a chiffchaff chirping nearby. I’m a bit amazed to have found nothing, and then this completely unfamiliar bug. 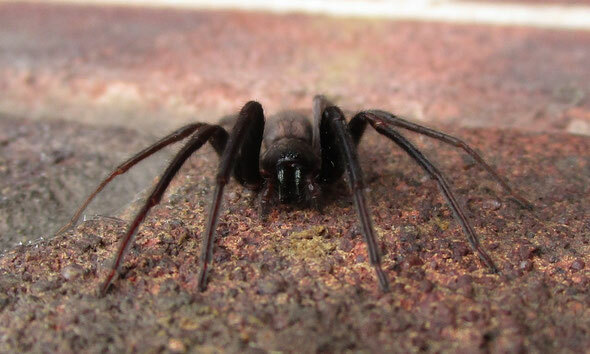 And then over the weekend, my son found an identical one in our back garden. 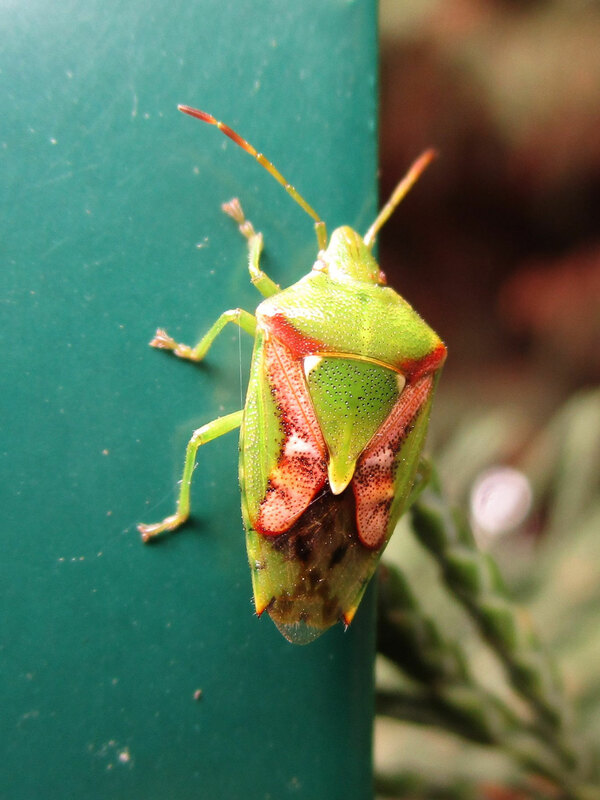 It turns out to be the juniper shield bug Cyphostethus tristriatus, about a centimetre long. According to my book, it is rarely found away from junipers, but truth to tell, I don’t even know what a juniper looks like. I’d be surprised if they have suddenly sprouted near the factory where they have never been before though, and even more surprised if there were any in our garden. I think this year may bring a bit of an irruption of juniper shield bugs. 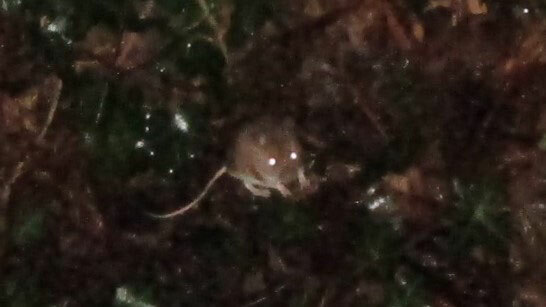 My mouse is back! I spotted it again on my way to work, in exactly the same place, in Church Walk opposite the entrance to the Grammar school. 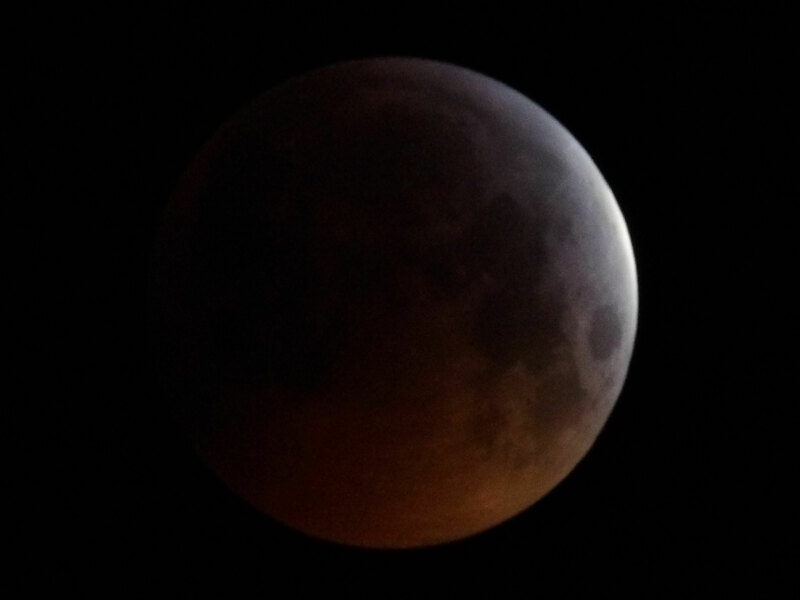 I got some marginally better photos this time as well! I had to go down to B&Q this morning, and seeing as it was such a bright, sunny day and B&Q is on a retail park by the Thames, I took my camera on the off chance that Benny the beluga would put in an appearance. 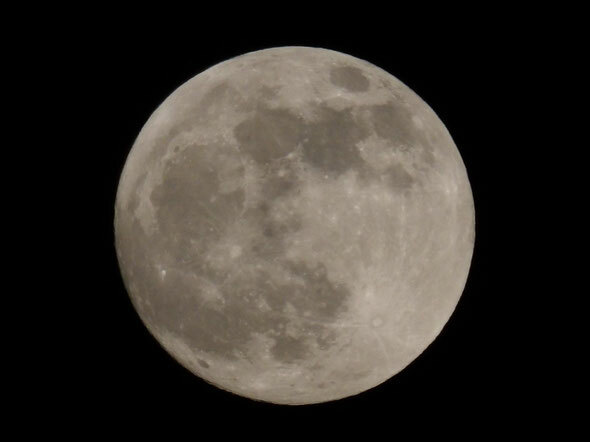 No one seems to know if he is still around; I was chatting to a guy down there who said he had spotted him three times, two of them close to where we were standing, but the last time was before Christmas. 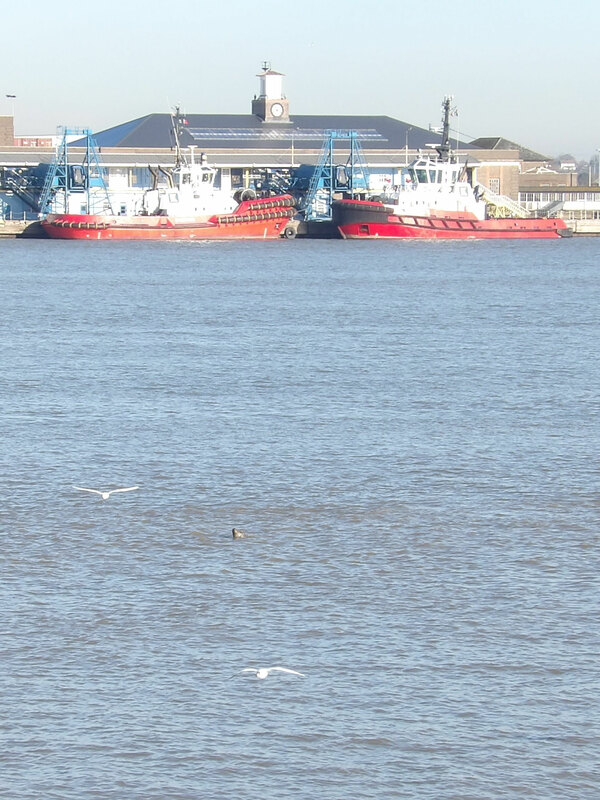 Needless to say, we saw no sign, but we did see a seal pop his head up briefly, which was a kick for me, as I have never seen one down here and didn’t realise we had seals in the river at Gravesend. 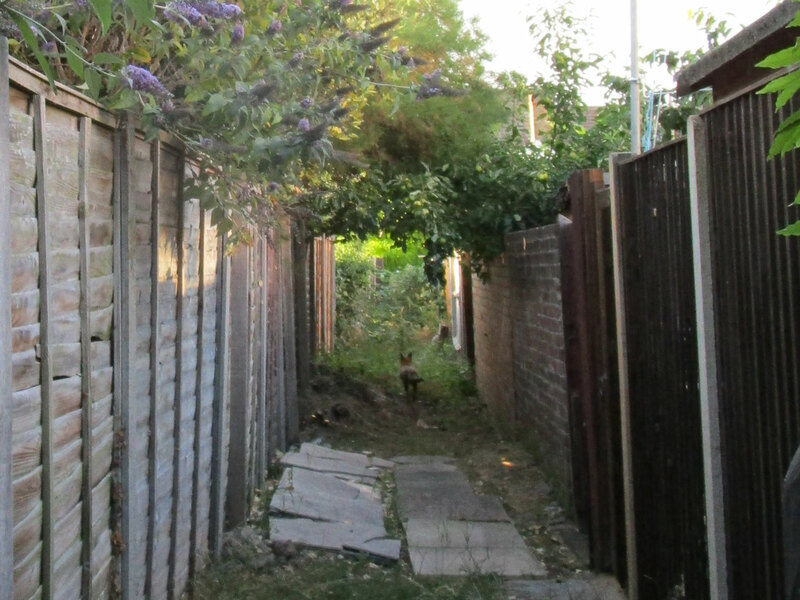 This is a strange example of the way things happen sometimes – walking to work down Church walk, I heard a rustling in the undergrowth on my right and wondered briefly whether it was a mouse or something – more likely a skulking bird like a blackbird or possibly a wren, I decided. 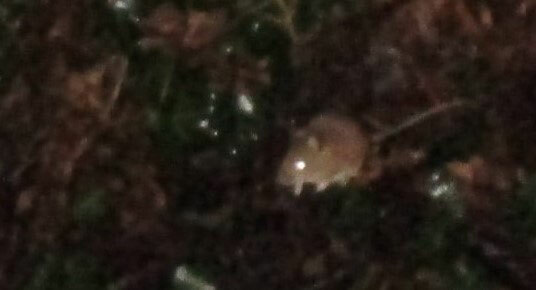 Then a hundred yards further down the road, there was more rustling to my left, and a mouse dashed out on to the road. It was really tame and stayed around for ages, but I had real trouble getting it on camera. 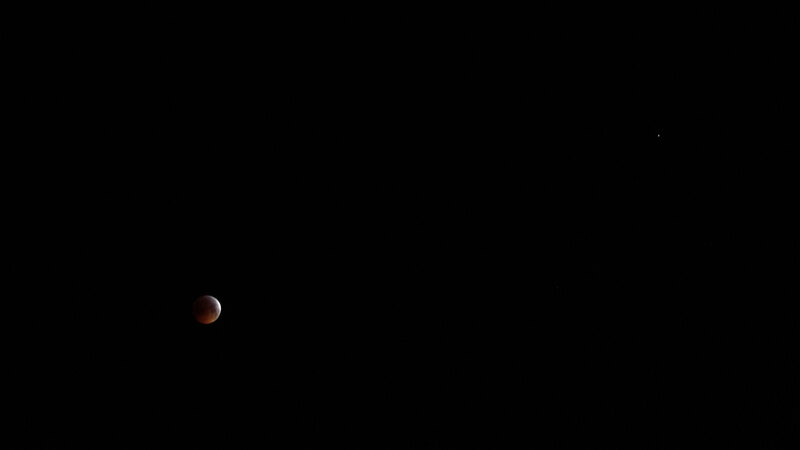 This is about the best I managed, almost putting it completely out of shot. 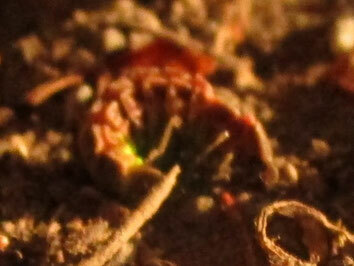 You can just make out its shape at the top, with a bright red eye reflecting in the camera flash. I looked it up at home and decided this is a wood mouse Apodemus sylvaticus. 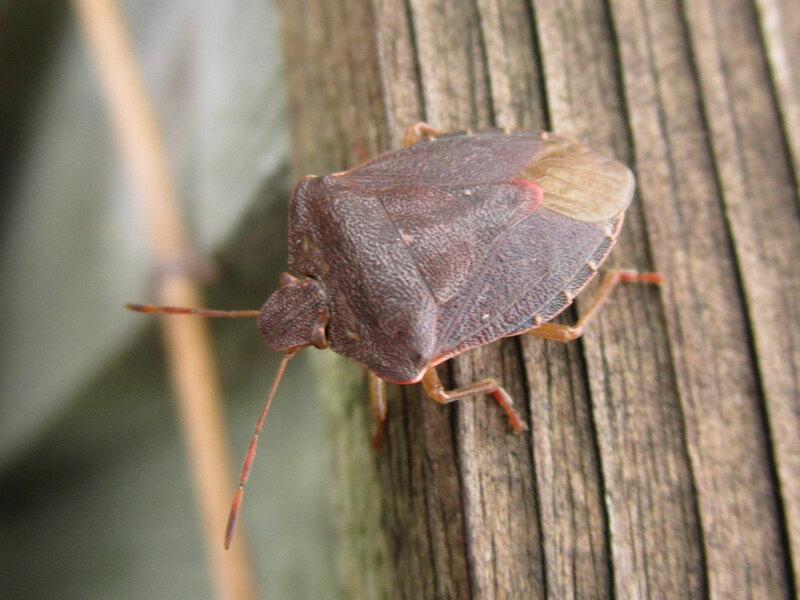 On this bright January day, I noticed a shield bug sitting atop the garden fence at my house. This is the green shield bug Palomena prasina, but like common lacewings, they go brown in winter. 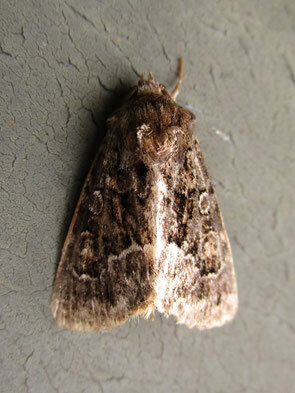 And here, to round off this record, is my last moth of the year. 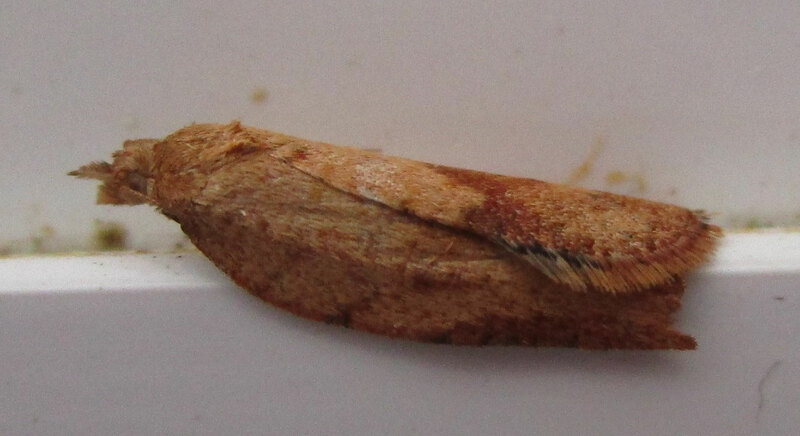 A small crambid similar to the one I photographed on Mon 24/09/2018, it may even be the same species – but if so, then it is more faded and less well marked. 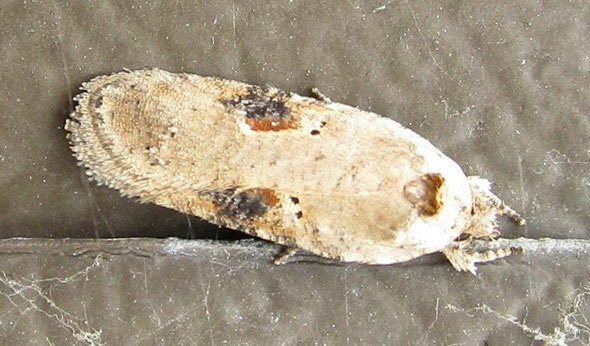 I still have that little tortrix moth kicking around in the conservatory somewhere, that I spotted a few days ago. 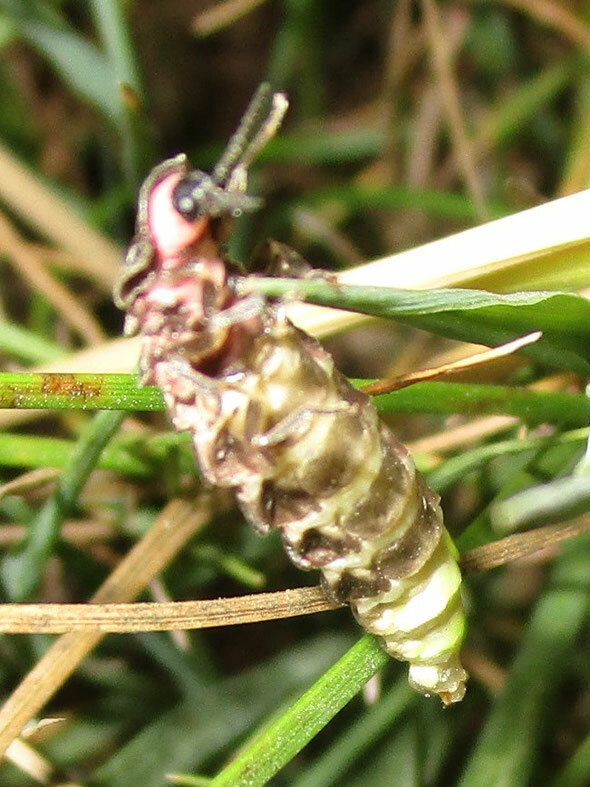 Maybe it will re-emerge in 2019? 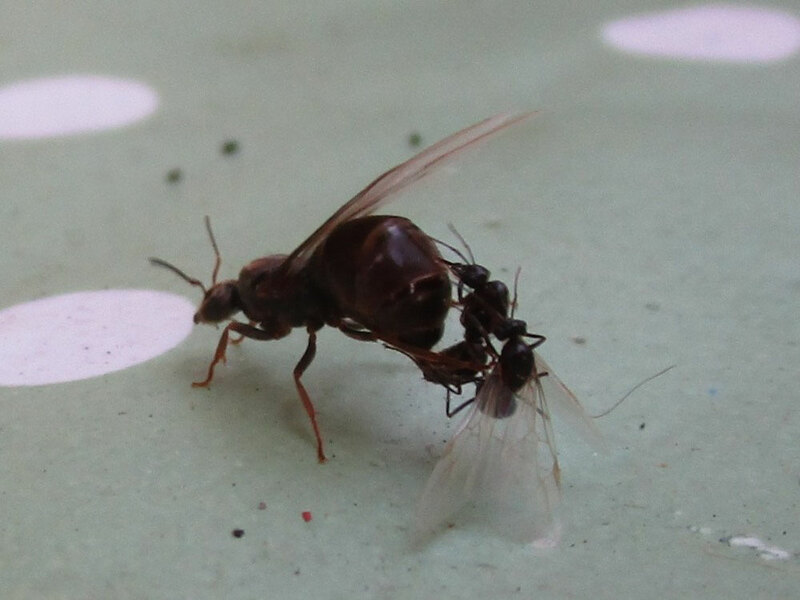 This was a slightly odd thing too. 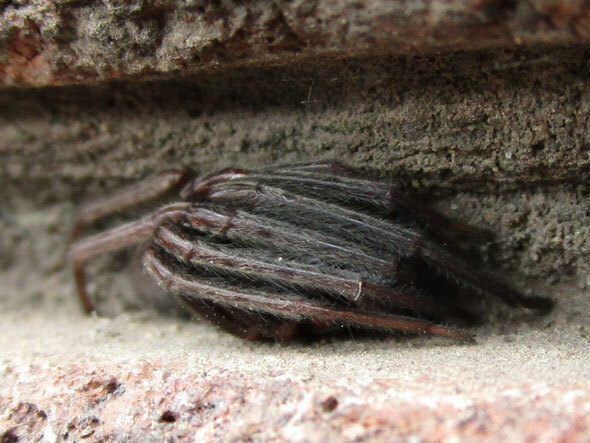 I noticed a tiny speck, just a few millimetres long, on the outside warehouse wall, but because I didn’t have my glasses with me, I couldn’t see if it was a creature, a drifting speck of fluff, or part of some dead insect. 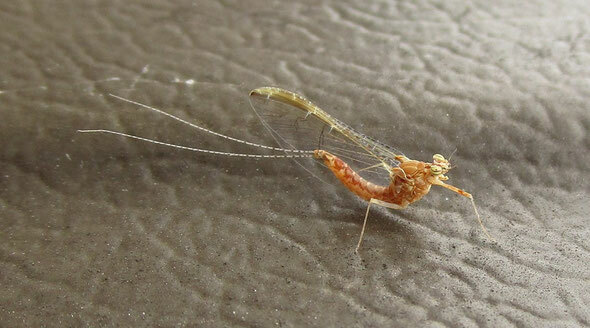 So I took a photo on deep macro zoom, but then decided it was probably a piece of bird’s dropping or something. 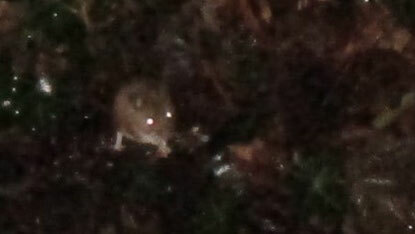 As it happened, when I eventually got round to checking my photo, it was a creature after all. I can’t really see whether this insect is still alive or whether it is an empty skin or dead, in fact I can’t even work out what it is. 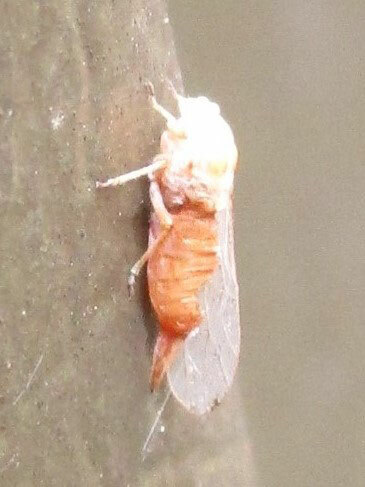 Some kind of aphid perhaps? I also found a little tortrix moth in the conservatory at home over the holidays, but it was too dark to take a photo. We’ll see if it hangs around. 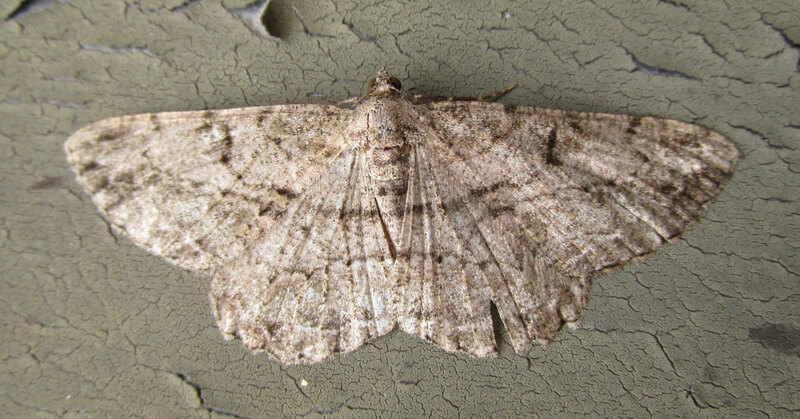 Haven’t seen any moths around the factory for a while, but this lone creature was resting on outside of the warehouse wall this morning. 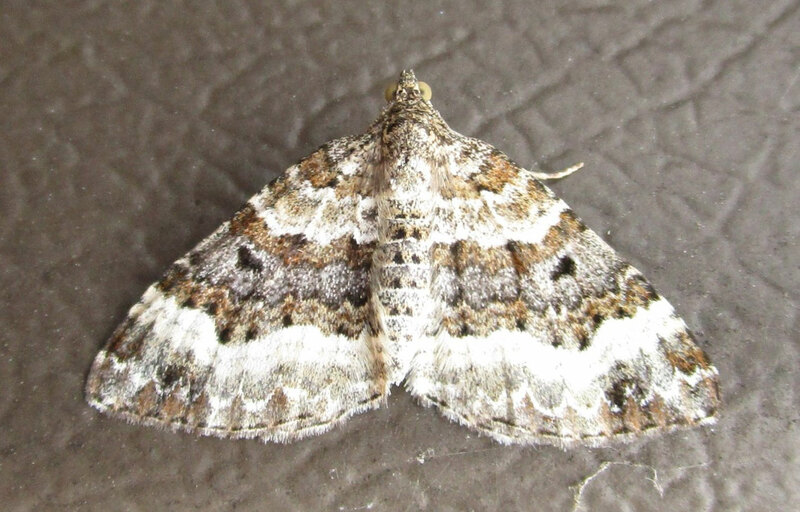 I couldn’t find it in my book so I Tweeted an image and asked for help – once again, ace illustrator Richard Lewington came back and identified it as the cypress carpet. It’s in the book all right, but it says it is uncommon, first recorded in the UK in 1984 and first in Kent in 1999. I imagine it has been proliferating somewhat since the book’s first publication in 2003, but still a good one for me! 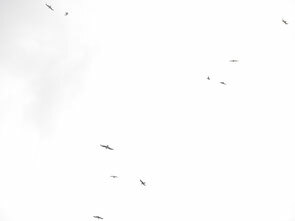 Today a flight of no less than 16 ring-necked parakeets came squawking high above our back garden, moving fast in a north-westerly direction. We have been seeing ones and twos of these parakeets here for just a few years, but I haven’t seen them congregating in these concentrations. Yesterday I saw a buzzard soaring over Lower Higham, just a couple of miles outside of Gravesend. Again, they are not unknown here, but it’s still relatively novel to see one this close to home. And just to continue the 'I don’t know what that is' theme for a while longer, this elongated fly got into the conservatory today. 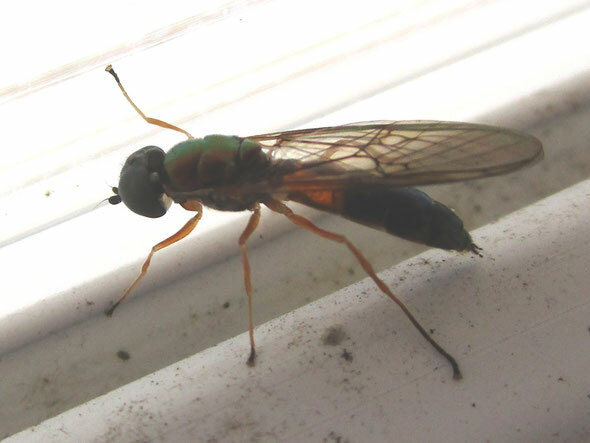 I think it is a species of soldier fly, probably the Centurion soldier fly Sargus bipunctatus. 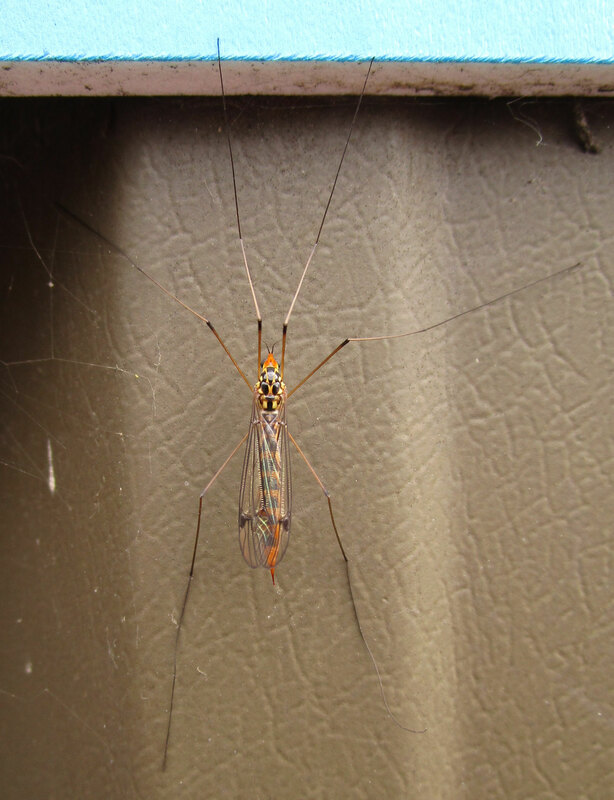 The orange patch at the front of the abdomen is almost translucent, and the thorax, which appears black against a bright background, is actually a metallic green. 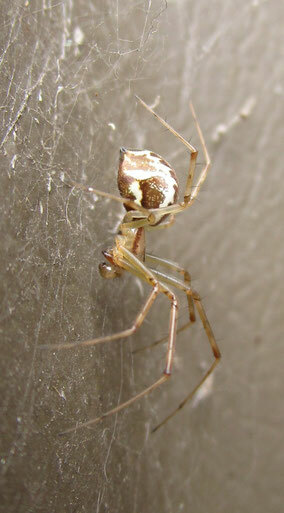 Found this tiny money spider lurking on a doorpost in Whitstable today. I was hanging around waiting for some other members of the family, so I took a photo because – well why not? 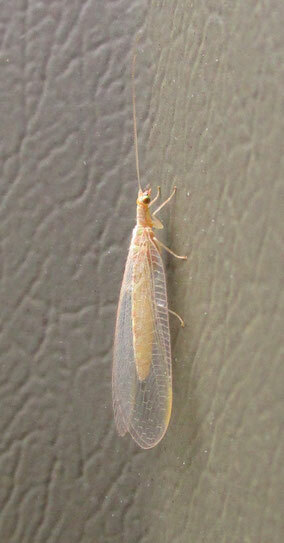 Found this nice caddis fly on the warehouse wall today. 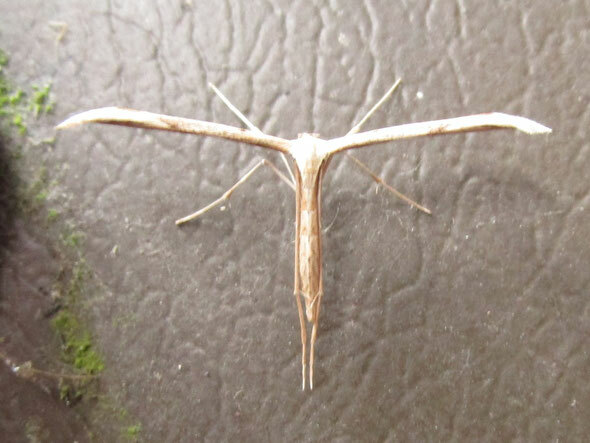 It’s about an inch long and really pretty ugly, but quite easy to mistake for a moth. 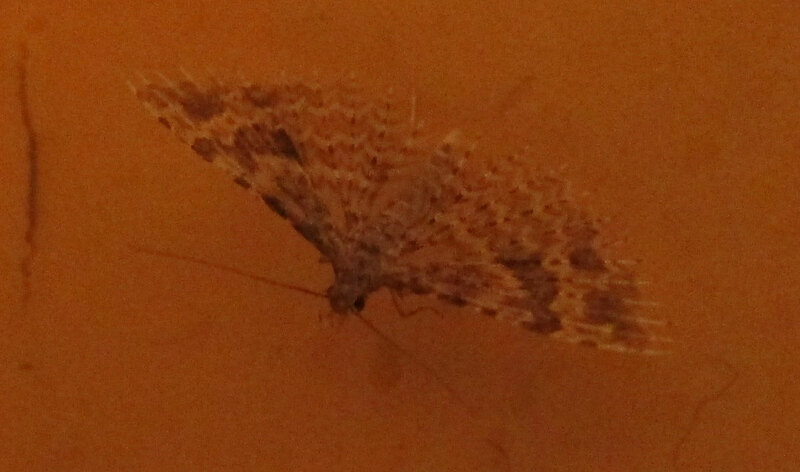 Back at work now, and this rather nice moth showed up on the warehouse wall. It is relatively large, a couple of inches in wingspan, but the first time I tried to get close enough to photograph it, I managed to spook the moth and it flew off. 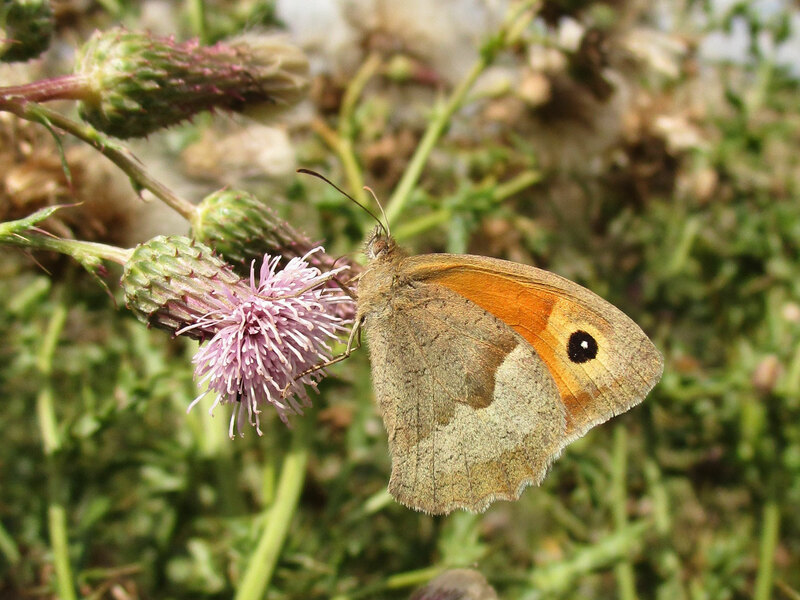 I watched it fluttering lazily around for a while, during which time it looked remarkably butterfly-like, with creamy underwings and brown forewings, maybe like a faded meadow brown. 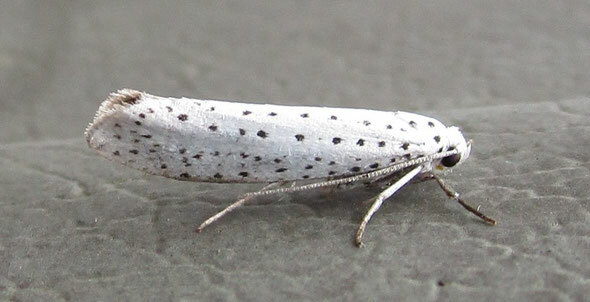 Then it landed again and I got the shot – this is the mallow moth Larentia clavaria. 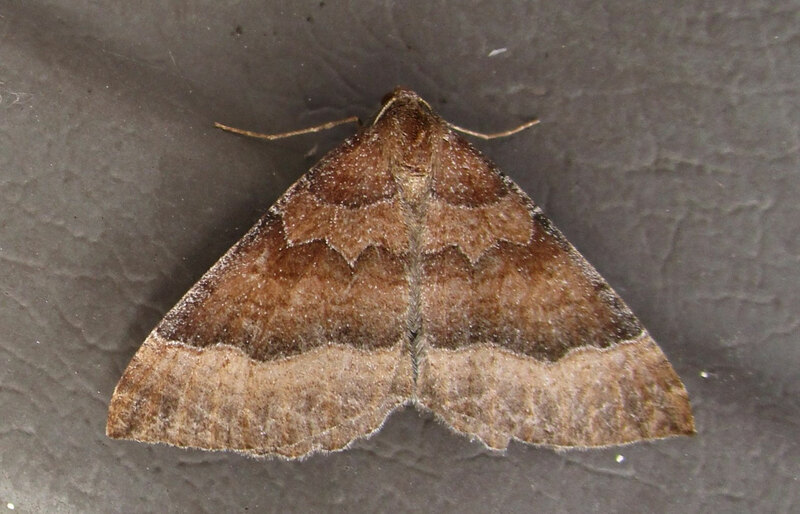 It is a late moth, with only one flying season from September to November – but according to my field guide, it is seldom seen other than at lights, so I consider this a bit of a coup! It seems to have been an outstanding years for dragonflies; out at Cliffe Pools, the air was thick with them today. A few large ones, quite a lot of medium-sized, and thousands of small-sized, some of them apparently pretty tiny. 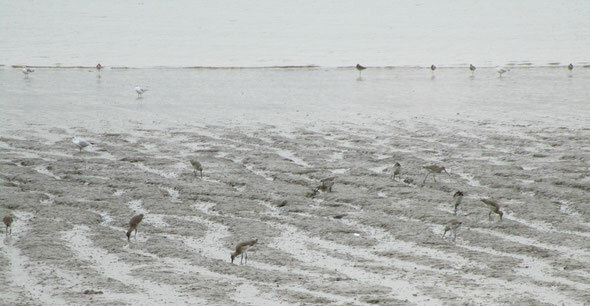 The only one that landed within sight of my camera though, was this little brown one with a red stripe down its back. I’m pretty confused about this; there are several small darter species that have red males with the four red spots on their back at the base of the wings. 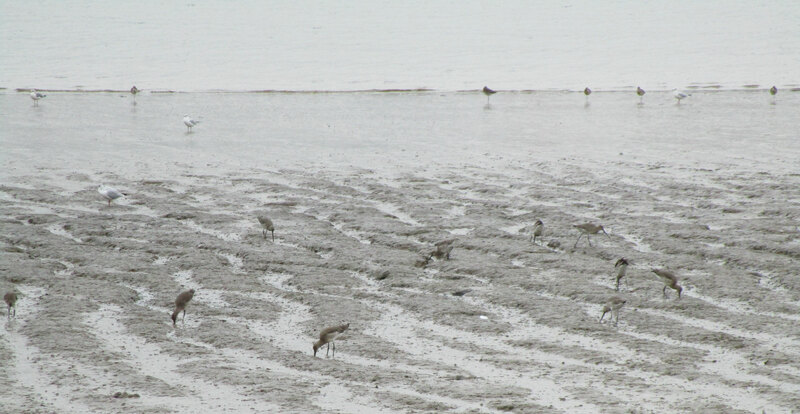 Most of these have brown females. But I can not find any species with a brown abdomen with a red central stripe and the four red spots. They also should all have a couple of black blobs towards the tail, which seem to be completely missing on this specimen, or hopelessly faded. I thought it must be a male, but either immature, or perhaps out of breeding colours, it being so late in the season? In the end I posted it on Twitter to see if anyone else knew the answer, and got the following ID from no less than ace nature artist Richard Lewington, who was the illustrator of my dragonfly field guide! 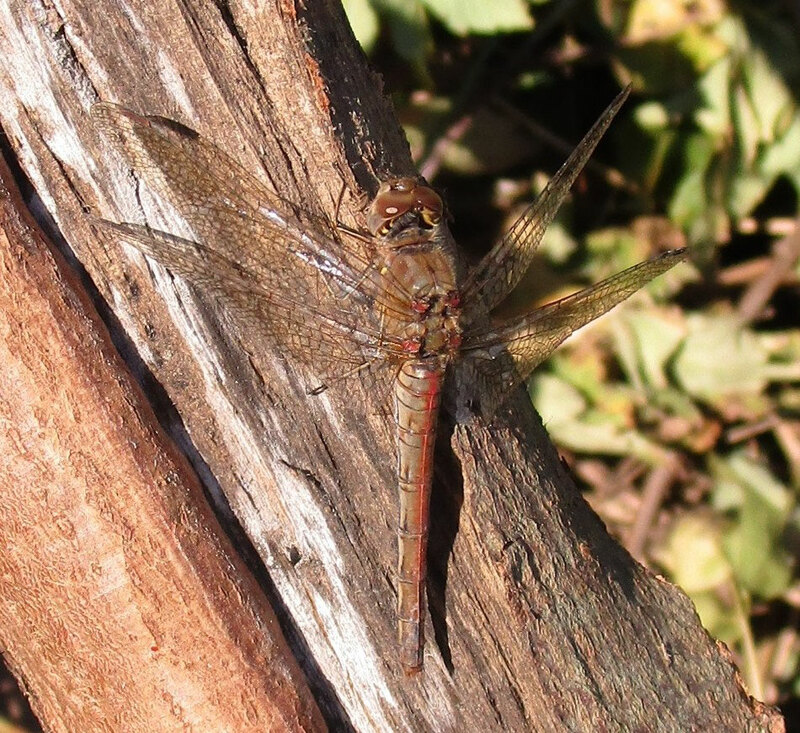 "That’s an old female Common Darter. 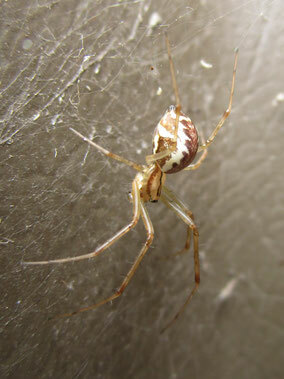 Females often become reddish as they age." The creepy-crawly population seems to be reasserting itself down at the factory. 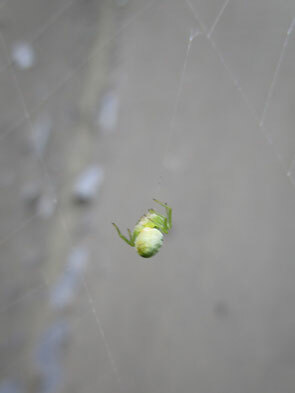 I was a bit surprised to notice this small green spider caught in a large orb web. 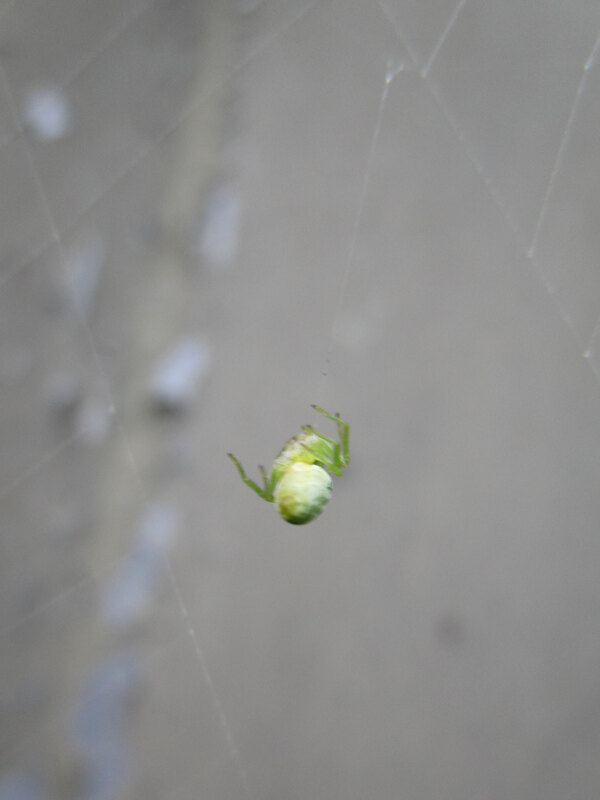 The orb web belongs to a common garden spider, but the little green critter is a Nigma waelckneri, and they usually live on the surface of leaves. There are no leaves within about 30 feet, and even though I occasionally find on one the warehouse wall, it would have had to jump or fly to find itself in this predicament. Strange, although it appears to have got away with it so far. 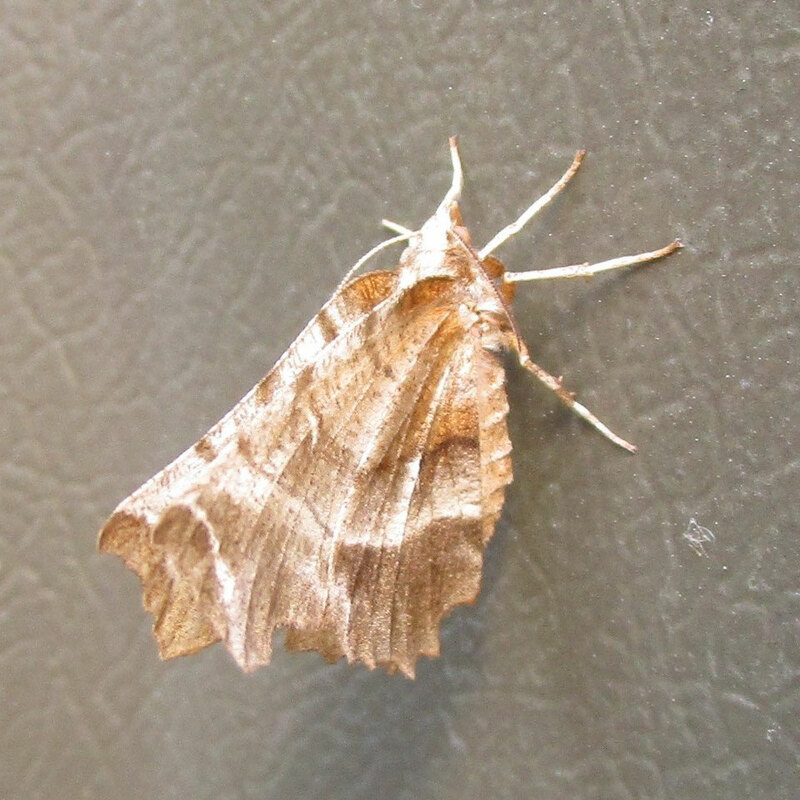 The moth below is a fairly common find down at the factory, on the metal warehouse wall as here. Despite having a good 2-inch wing span it is easily overlooked in the wild, being perfectly bark-camouflaged and almost completely flat! This relatively small (half an inch) noctuid moth drew my eye and I took a few photos of it, but to be honest it is so incredibly vaguely marked that I can’t be bothered leafing through the moth book page by page in a vain attempt to ID it. 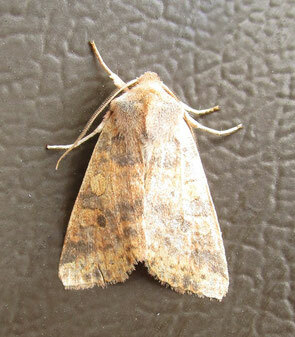 It is a nice warm orangey brown, but must remain forever obscure I think. 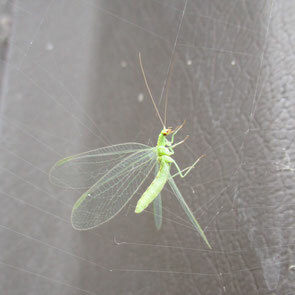 The lacewing below, on the other hand, is a beautiful creature. 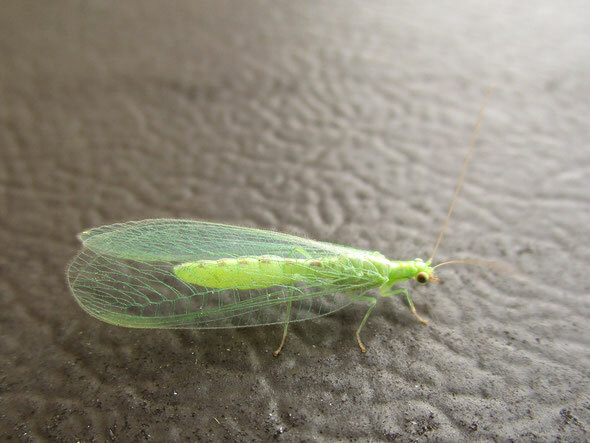 It has no noticeable blotches on the wings or spots on the head as mentioned in the guides for some of the other common species, so I think this is the most usual green lacewing Chrysoperla carnea. At last, a fairly chunky moth on the warehouse wall at the factory. 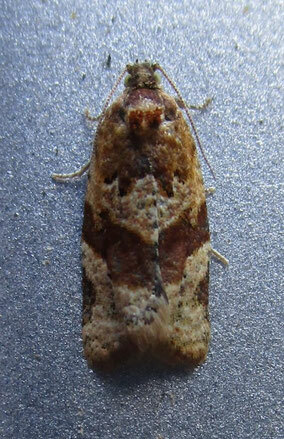 This is the large yellow underwing, with a wingspan of about 3 inches. It is about as pale brown and boring as possible when at rest, but the underwings are a spectacular golden yellow with dark brown borders. Some moths will let you tickle their wings open slightly, but these ones are pretty skittish and fast-flying, and it was almost out of my reach up the warehouse wall, otherwise I might have had a go at getting it on to my hand – but it probably would have flown the coop anyway. Found this little Crambid moth on the outside of the warehouse. After a generously moth-filled summer, early autumn has been a bit barren, otherwise I might not have bothered taking a shot of this innocuous little thing. It is spectacularly marked though. 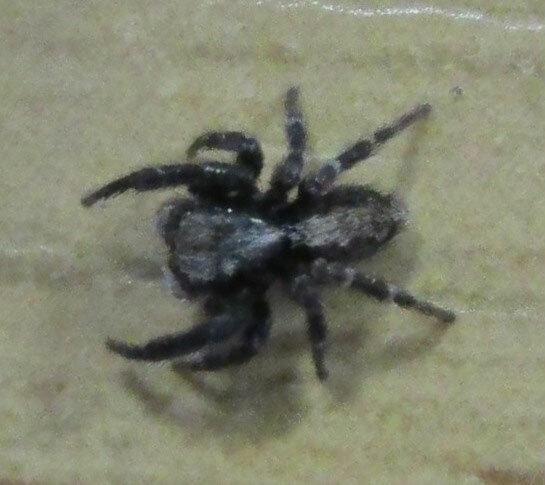 This tiny jumping spider appeared on my desk at work today. 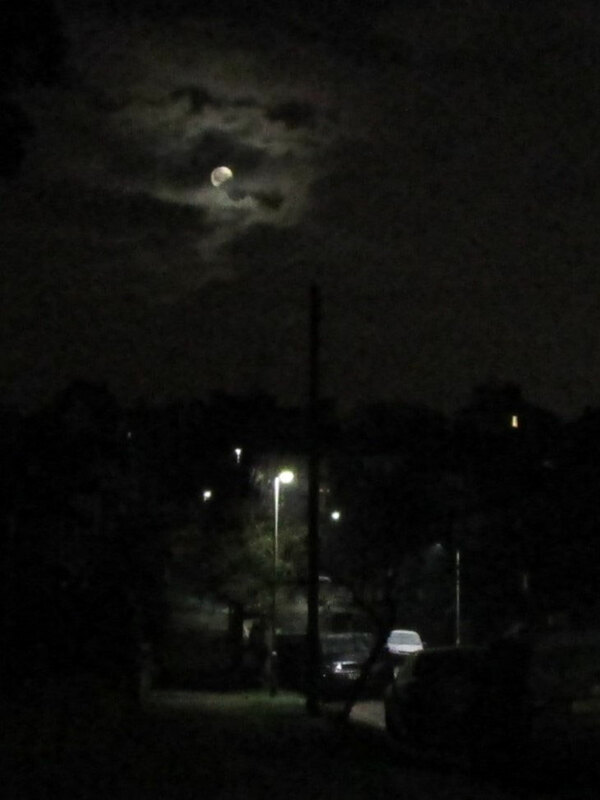 The light conditions were not exactly conducive to photography, but I had a go. I’m fairly confident this is the common species Euophrys lanigera. Always a pleasure when an emerald moth turns up at my place of work! 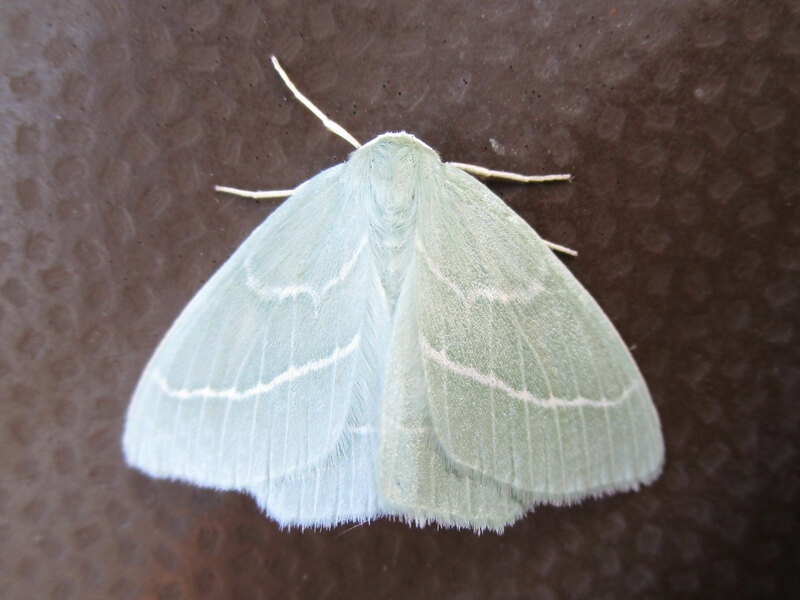 This one is the light emerald Campaea margaritata. 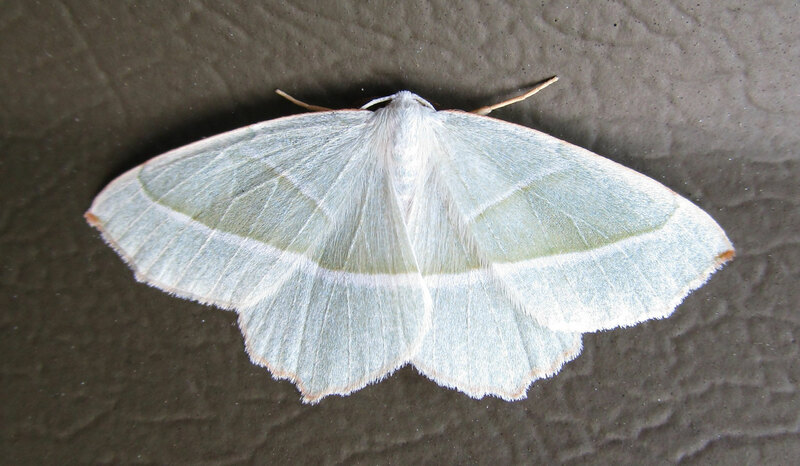 Light emerald moth Campaea margaritata. 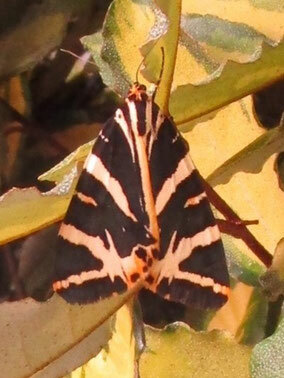 Here’s a moth I didn’t recognise; I don’t think I’ve ever seen one before. This is the wax moth, a couple of centimetres long and with a distinctive bullet shape! 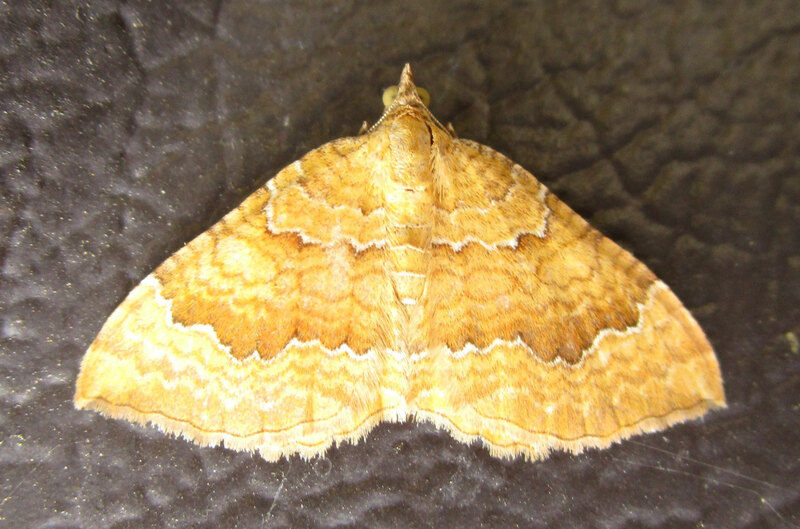 This attractive moth showed up at the factory; this is the yellow shell Camptogramma bilineata. 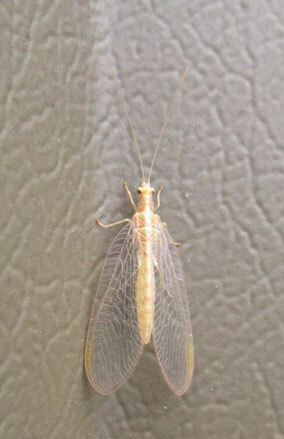 Below that is something I wasn’t expecting to see at this time of year though – a mayfly, also on the factory wall. Back home now of course. 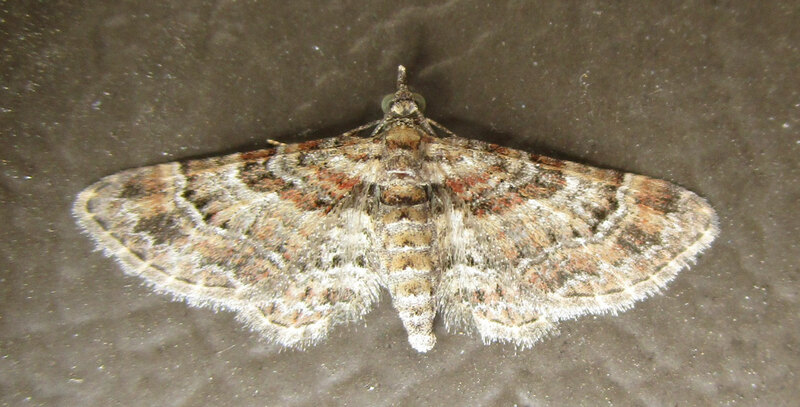 The moth above showed up on the outside of the factory wall at work; it’s only a small one, but I think this is the double-striped pug. 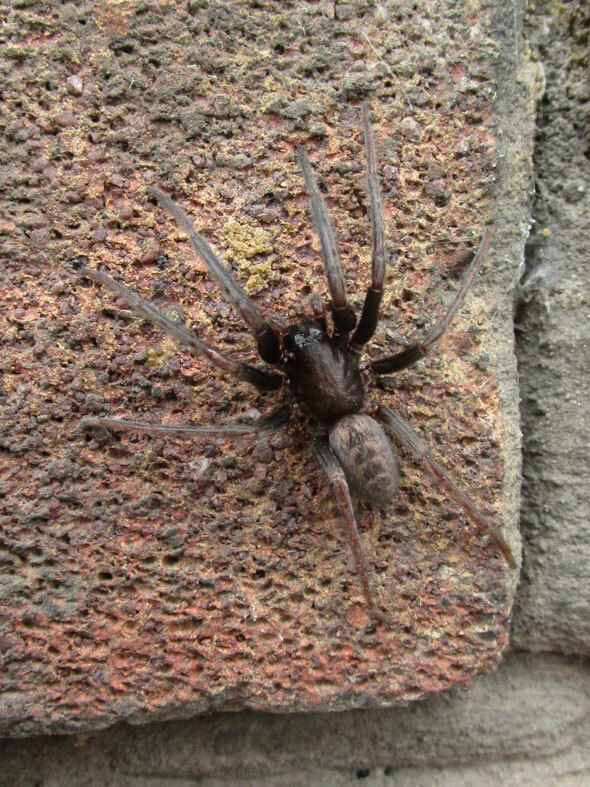 They are dead common and range from quite intense brick-red stripes to worn-out and washed-out fawn. This one is more or less halfway between the two. 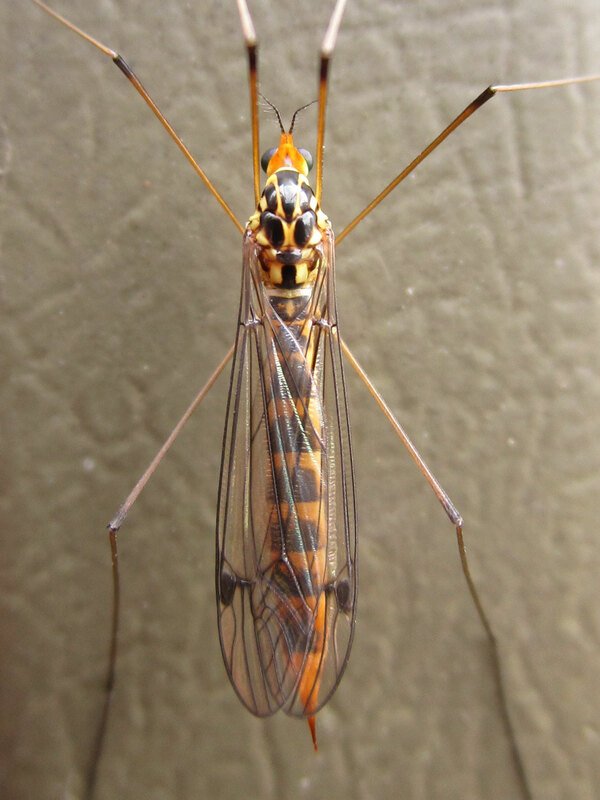 On the left and below is a particularly well-marked crane fly of the genus Nephrotoma, the spotted crane fly. 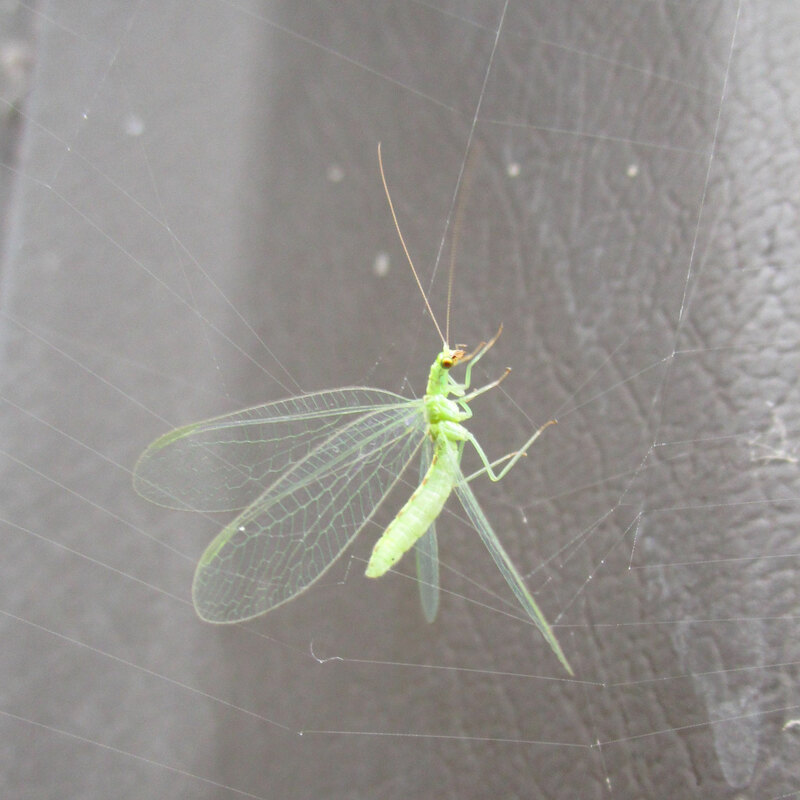 I think the dark smudge on the wings makes this Nephrotoma quadriferia. The spider below, Linyphia triangluata, is quite small at about a centimetre long, but is huge and colourful considering it is actually a money spider, which are usually tiny and black or brown. Another thing they usually do is hang upside-down from hammock webs in bushes or long grass, so to find one in a vertical position on the factory wall is a bit unusual. The swollen pedipalps (the organs on the front of its head) show it up as a male. Caterpillars today! 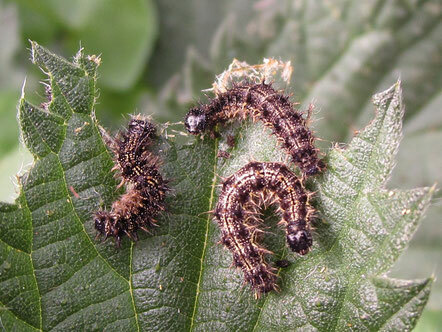 Being a fairly rustic location, there was a nettle patch just over the road, and I found a colony of these small tortoiseshell caterpillars, in the mid-stages of their development..
Up at Mappleton beach, this spiky fellow was crossing the road. It was actually blown over by the wind at one point! 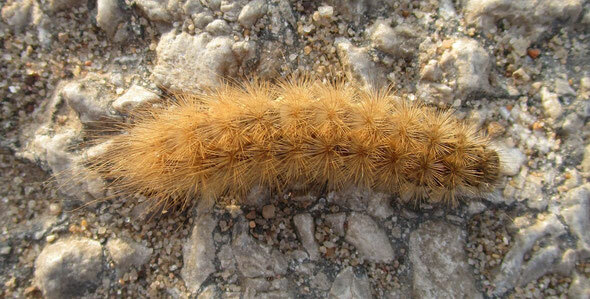 This is the caterpillar of the buff ermine moth Spilosoma luteum. Peacock butterfly Aglais io, again on buddleia! 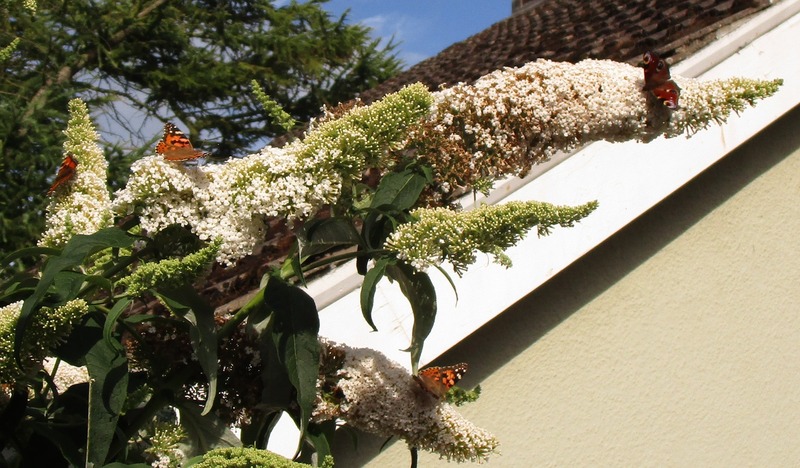 The first week of August saw us taking a break in south-east Yorkshire. The swifts were still in full flight when we left, but I considered that they would be mostly gone by the time we came back. Be that as it may, today we took a trip down to Spurn Head, a long, lean spit of land that tails off of the Yorkshire coast downwards into the Humber estuary. The spit itself is the result of erosion further up the coast, where silt and mud has been washed away from the cliffs and deposited here at the extreme south-east corner. There is a lighthouse and a coastguard’s station right down at the tip, so the authorities have endeavoured to shore up the road, but it is often buffeted by storms, and one just a couple of years ago washed a great section of the road away and effectively ended any plans to continue the hopeless defense. 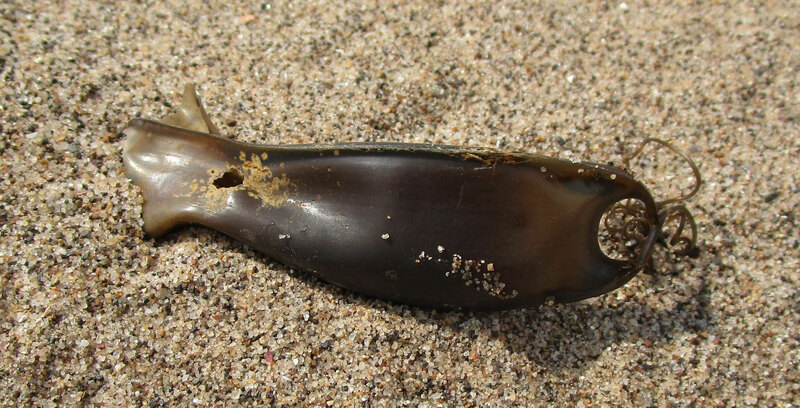 Still, there is a nice stretch of shingle beach at the landward end, and here I found a mermaid’s purse, empty sadly, but still a nice find. 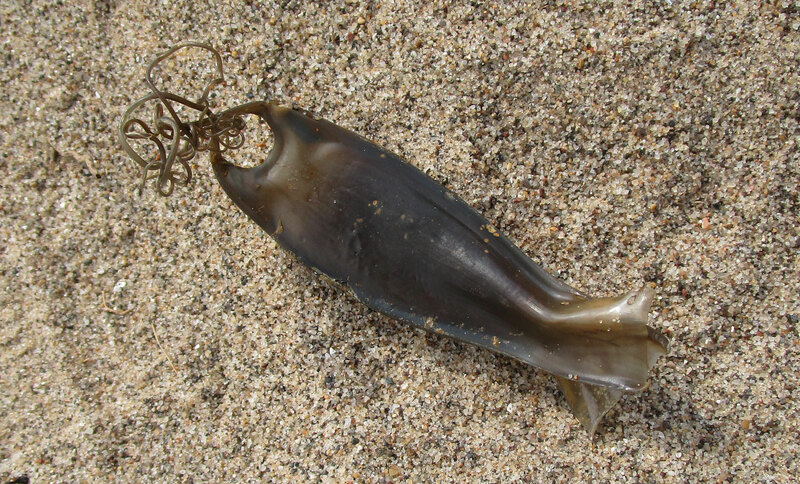 The so-called mermaid’s purse is the egg sac of a dogfish. I took the kids out to Jeskyns on this screamingly bright day and spent some time grubbing about in the undergrowth looking for bugs and stuff. 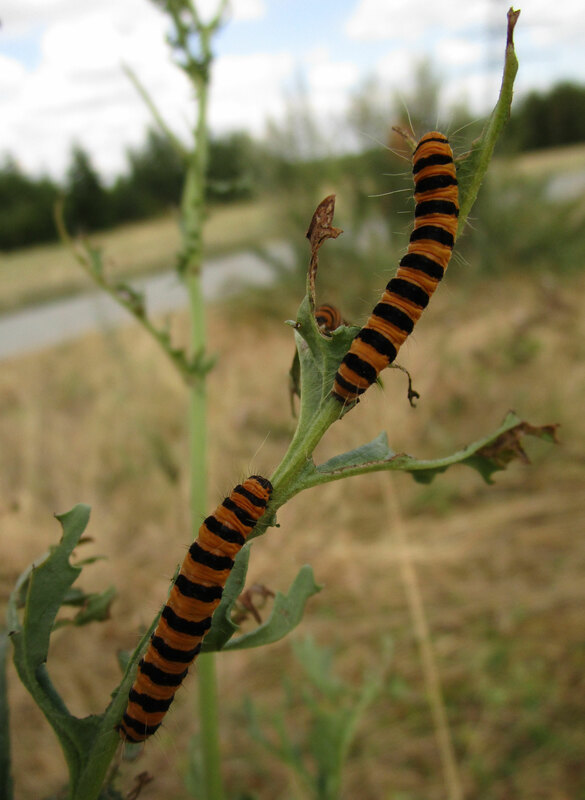 Found several second-generation cinnabar moth caterpillars on a ragwort plant; these critters look to be full-grown. Whether they will have time to pupate this season, or whether they are next year’s batch remains to be seen. 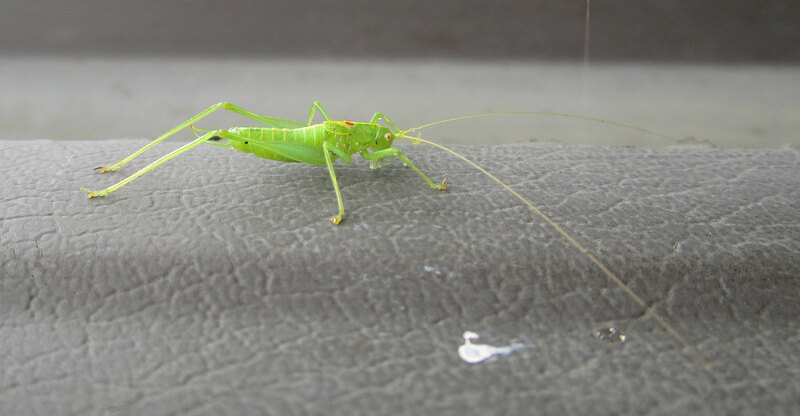 I could hear loads of Roesel’s bush crickets around. And was trying to track one down. 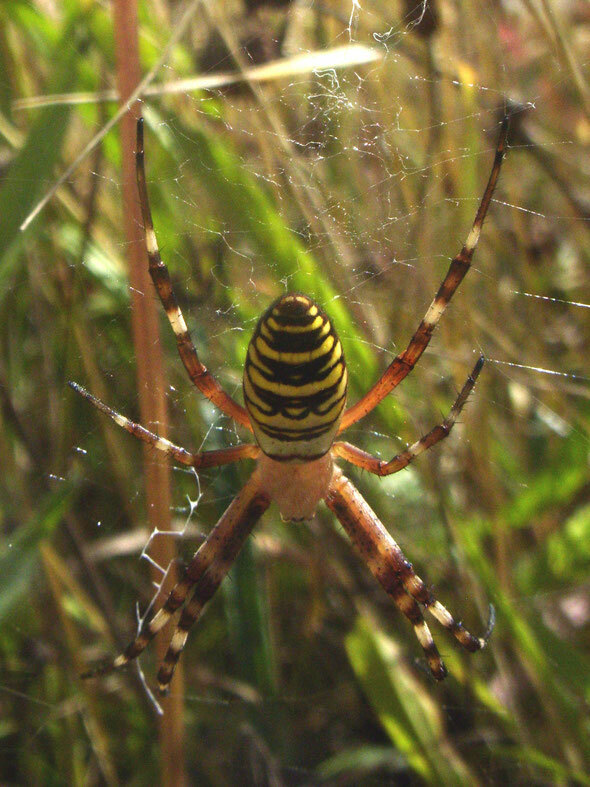 I did eventually find one but wasn’t able to photograph it; as it happens though, it was right next to not one, but two female wasp spiders in close proximity. Not much in the way of unusual butterflies, but there were at least some good poses as they were drawn to the small thistle flowers. 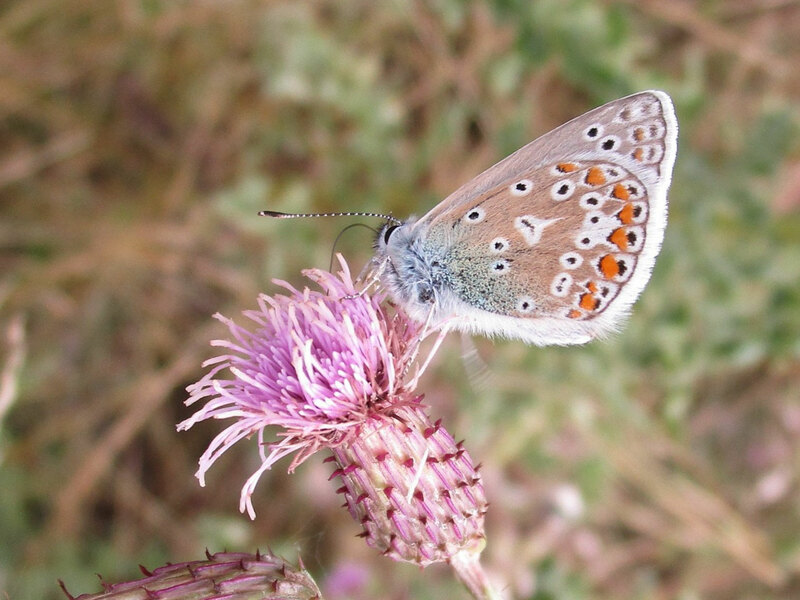 Down at the bottom are a common blue and a small heath. A couple of minor moth entries today – firstly, this photo of a common plume. I have taken dozens of shots of this species in the past; it is one of the commonest moths in this area and is active all year except when it’s literally too cold to move. 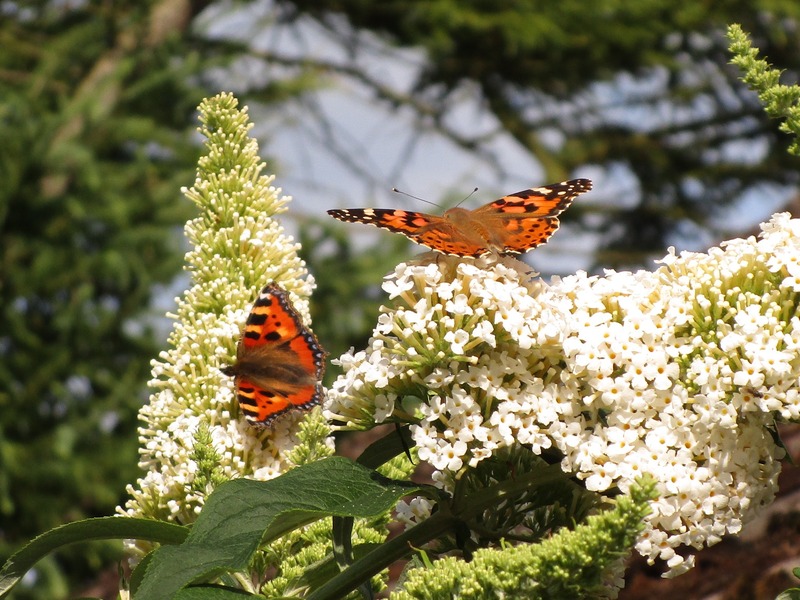 But for some reason it is very difficult to photograph – in bright light it is too reflective; in dull light on too dark or light a background the light metering gets messed up. 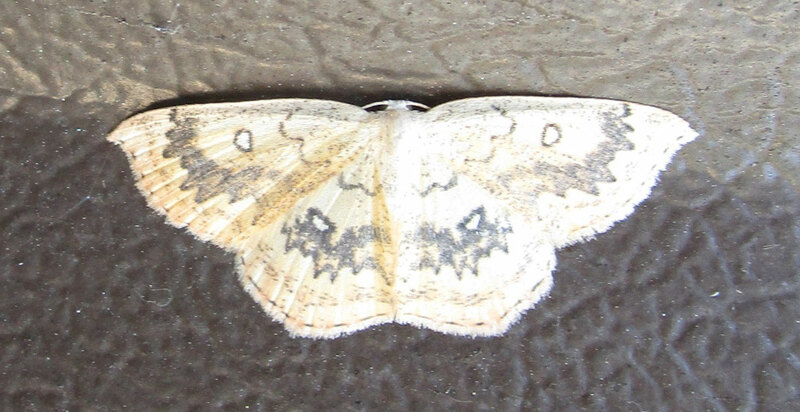 But for some reason I thought this one might come out; it is in intermediate light against a background similar in shade to the moth itself, which means the exposure should be just about right. 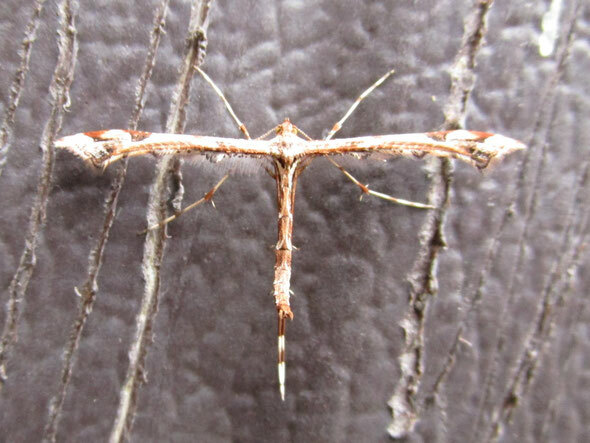 And indeed, for what it’s worth, I think this is my best common plume moth shot yet. 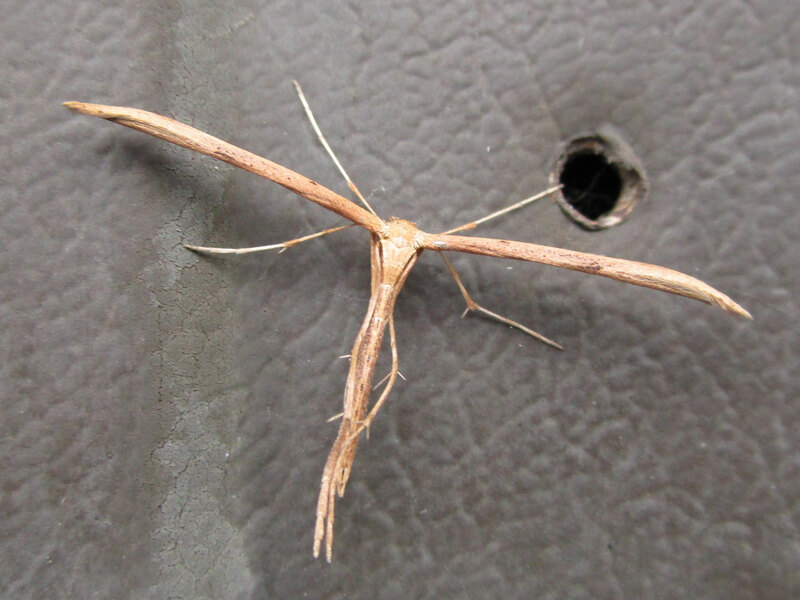 l also found this razor-thin micromoth flapping about in the car park. 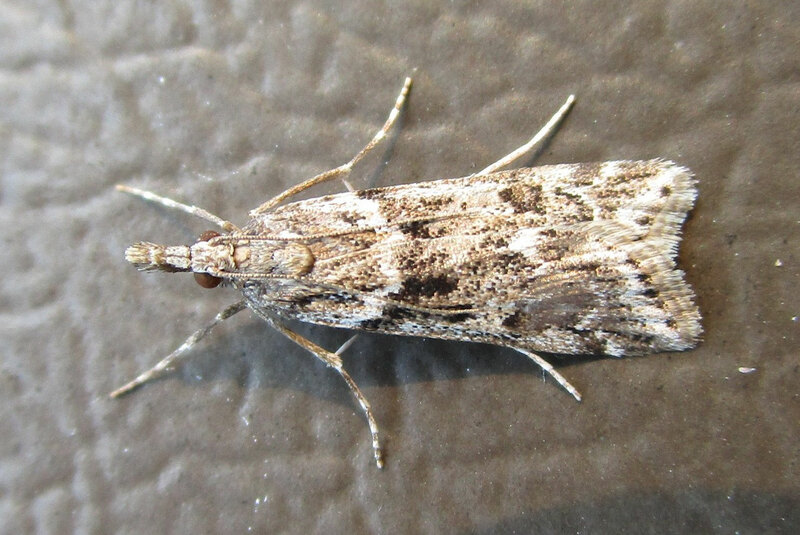 This is the diamondback moth Plutella xylostella. 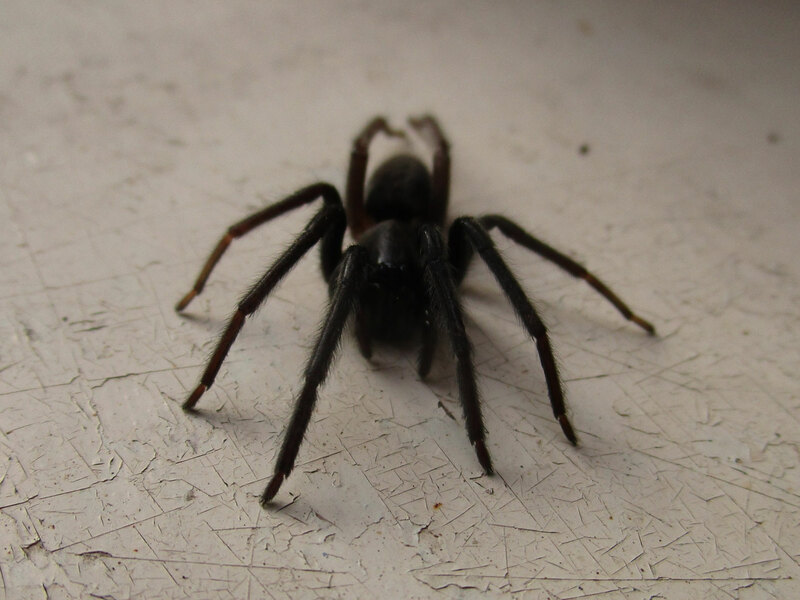 Can you see what I mean about the light metering? This moth is on a dark background, so the camera has boosted the light to compensate, and now the moth itself is over-exposed. Ptchah. 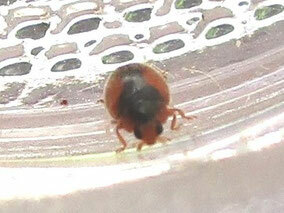 I also racked up my 8th ladybird species of the year with this nice 22-spot. 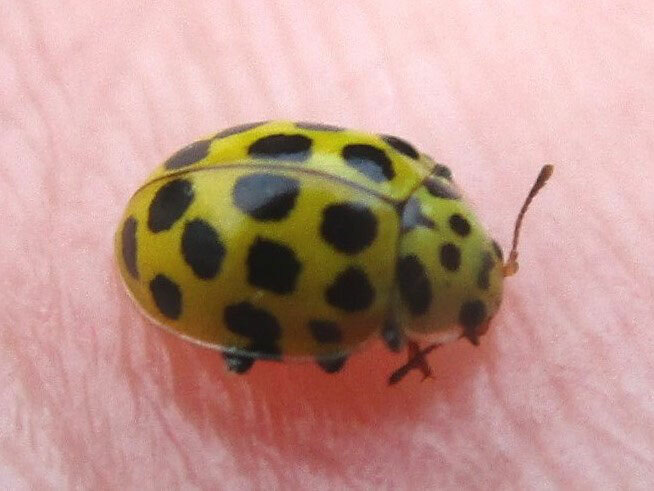 They are smaller than the familiar read-and-black varieties, about the same size and colour as the common 14-spot, but with a different pattern of markings. Found this half-sized Segestria on the wall outside the front door today. 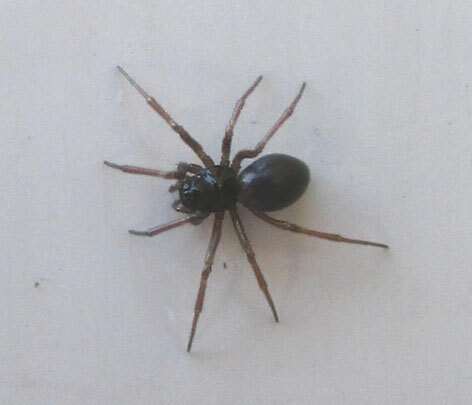 It seemed a bit wiped out, and didn’t stir even when I knocked it off on to the windowsill. 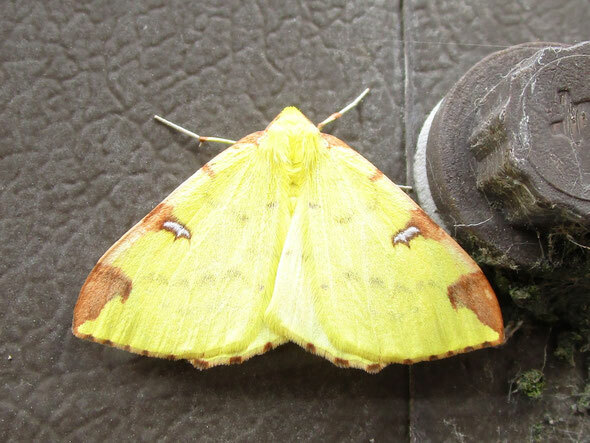 Found this lovely one on the outside of the warehouse at the factory today – the brimstone moth Opisthograptis luteolata. A few more moths at home today! 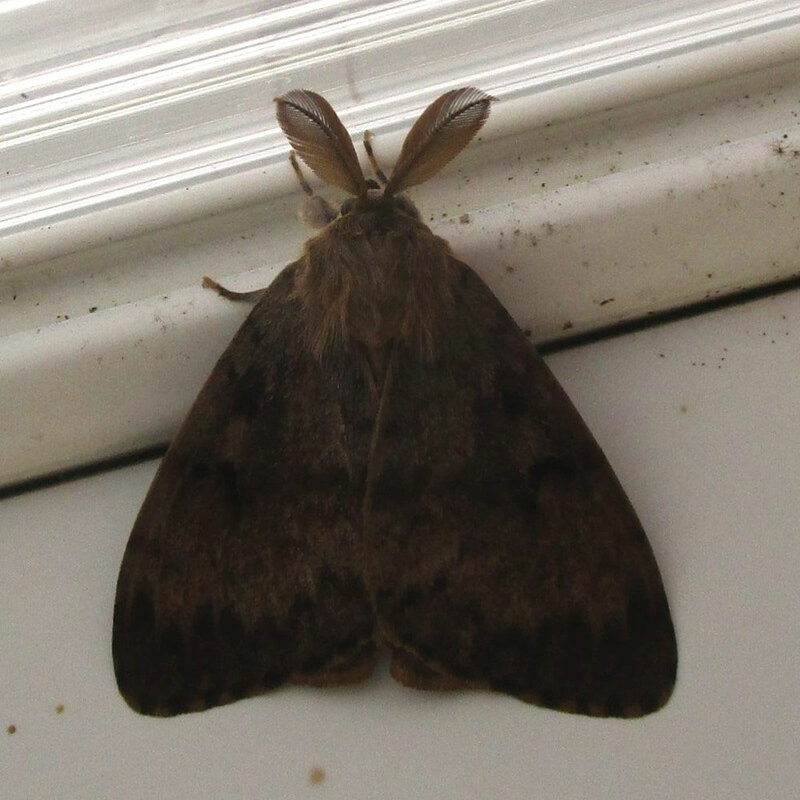 This big moth, with a wingspan easily over two inches, has amazing feathery antennae that resemble rabbit’s ears. 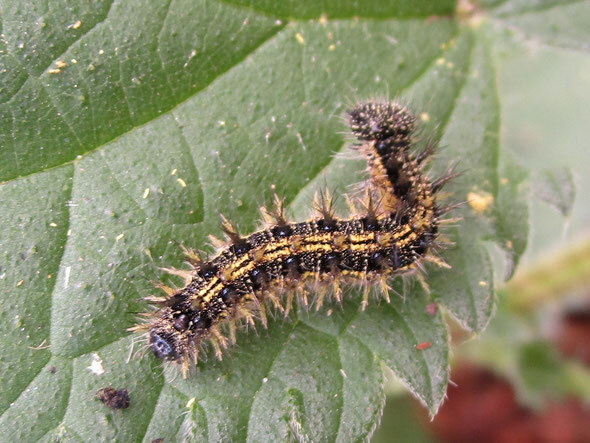 This is a male gypsy moth Lymantria dispar, a troublesome pest of various trees. 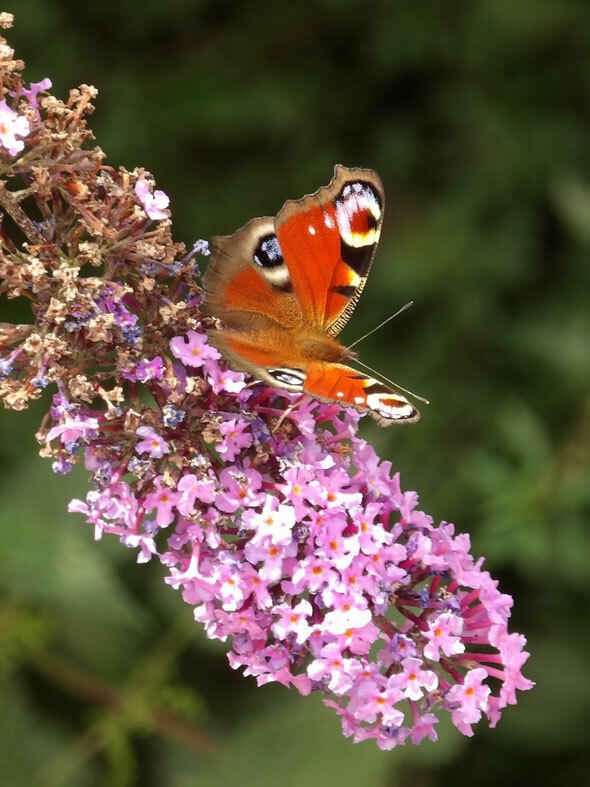 It went extinct in Britain in the last century, although still appeared as a migrant – more recently though it has staged a bit of a comeback in the south east. 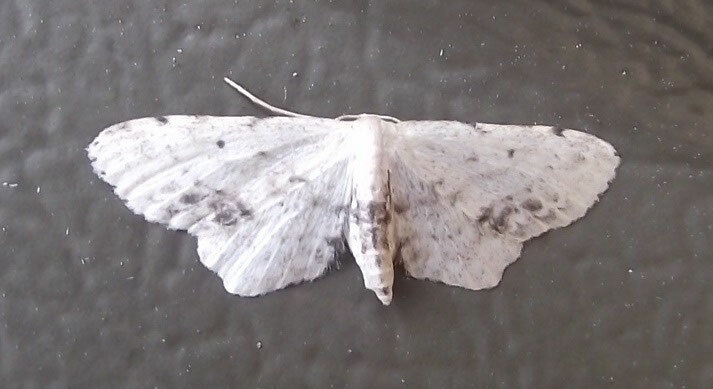 The female is larger and almost white; the Latin name dispar means ‘unequal’, and refers to the dimorphism between the sexes. Lymantria means ‘destroyer’ – make of that what you will. This tiny, frail moth is the Twenty-plume Moth Alucita hexadactyla, whose wings are so deeply divided that it looks as it it has 20 feathery wings. 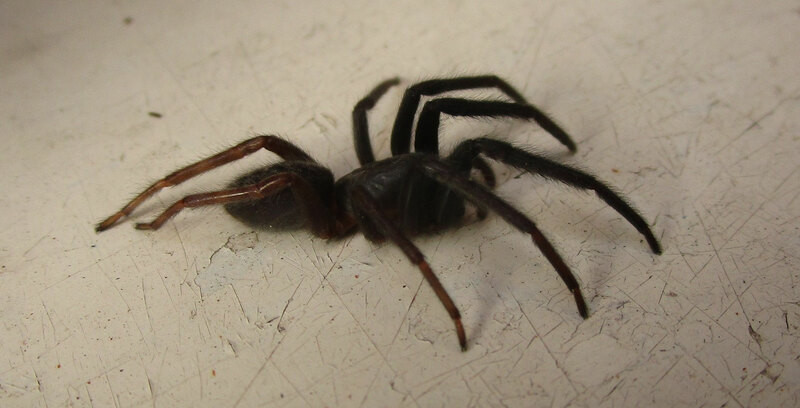 Bit of a rubbish photo I’m afraid; this was in the kitchen and it was getting dark. 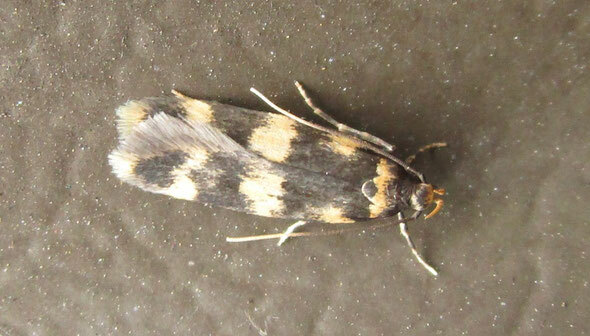 Above is another small moth, about a centimetre long. The sharp, triangular shape, prominent dot on each forewing and warm, straw colour give it away as the straw dot Rivula sericealis. Below, at last, I found ‘the other’ common variant of the riband wave Idaea aversata, (compare Fri 13/07/18). 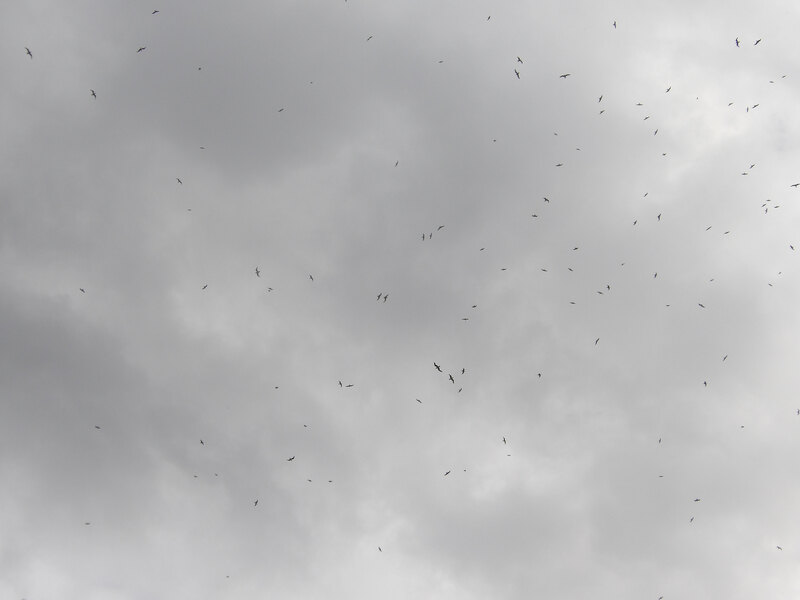 While we are about it – well it was warm if somewhat overcast, so I was sitting in the garden when this huge cloud of gulls started wheeling overhead. 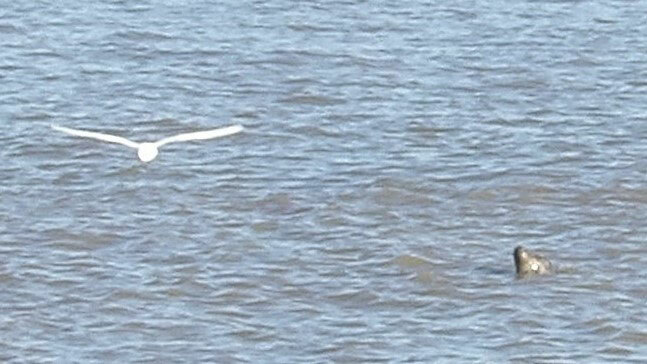 Not sure what they were after exactly, but it seemed like a jolly gathering; mostly black-headed gulls I should think. 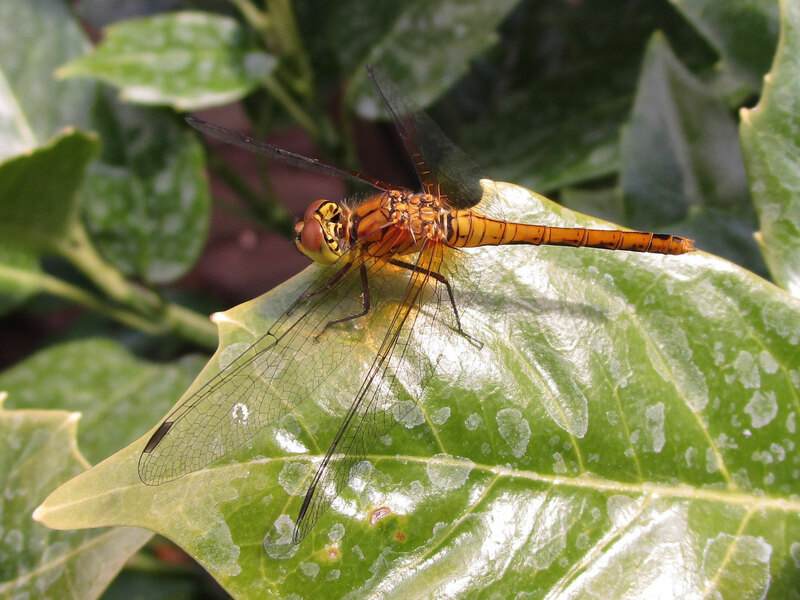 The yellow dragonfly below turned up in our back garden today and stayed around for ages while I took loads of photos. 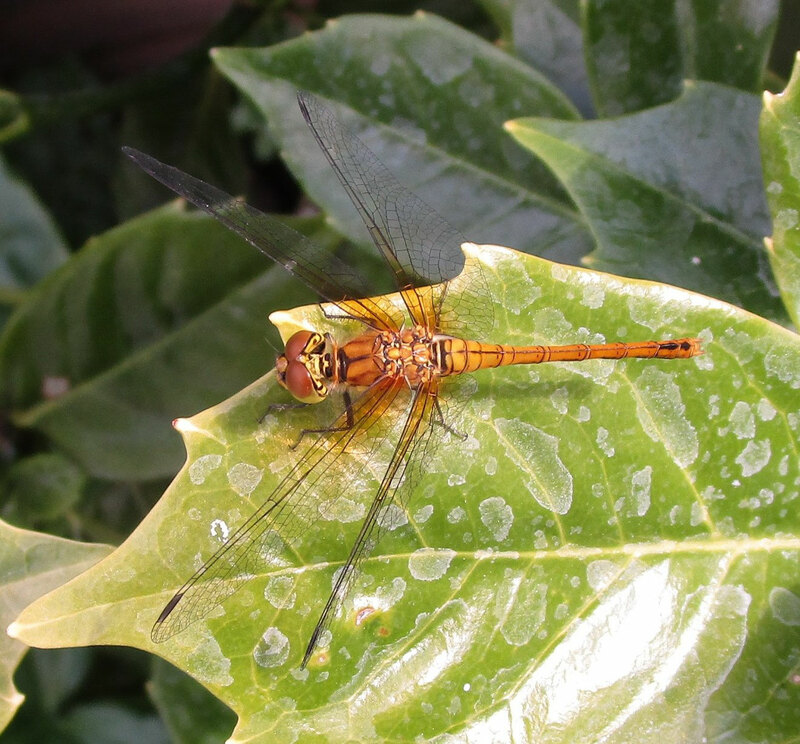 I believe this is a female ruddy darter. More moths today! 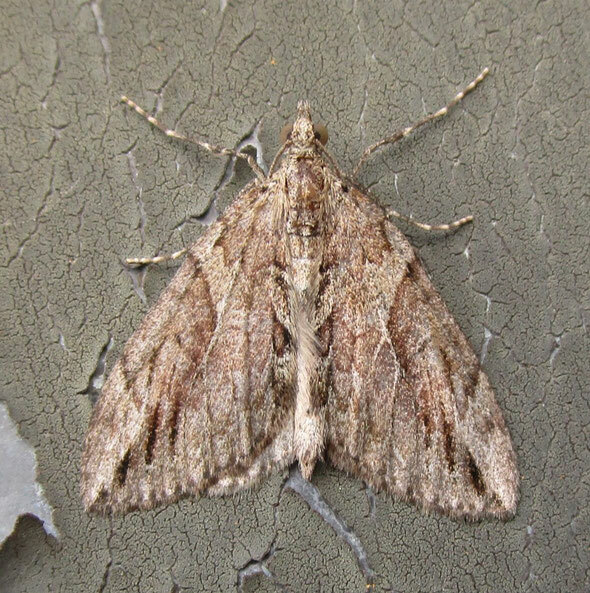 The most interesting was this one here, which looks like a riband wave, the same size and straw background colour, but with the dark band smudged around a bit, and some natty lace fitted around the collar. 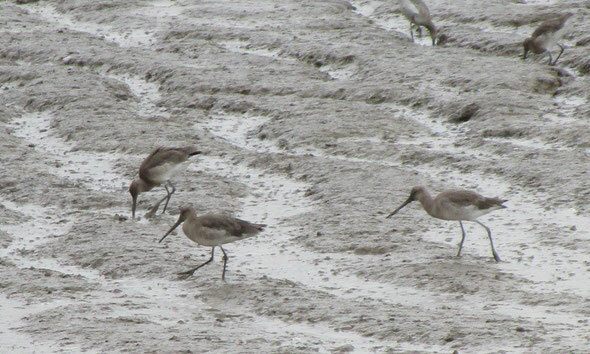 The slightly hooked wing tips are a bit of a difference though. It turns out this is the mocha, a new species to me although not rare by any means. Now the bottom one really is obscure – hardly any markings at all to latch on to! 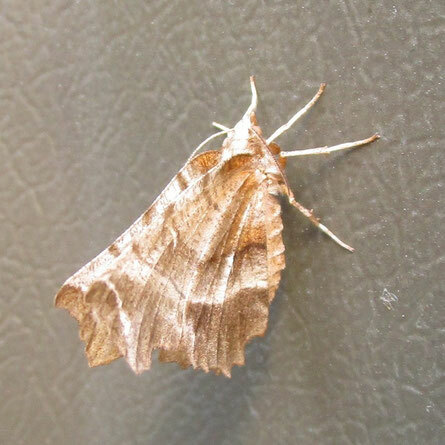 A thorn moth – but which one?? 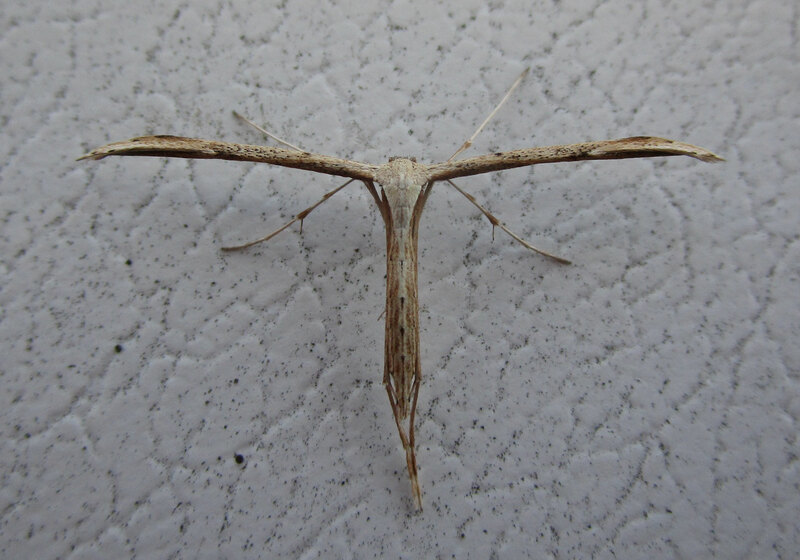 This pretty neat thorn moth almost escaped detection completely, resting a few inches above the ground with its wings folded above its back like a butterfly. 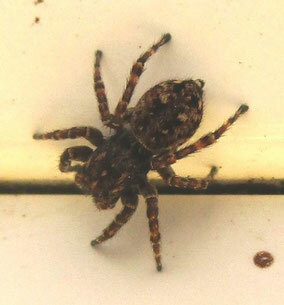 I took some more shots of the little jumping spider today, seeing as it has been hanging around for a fair while. 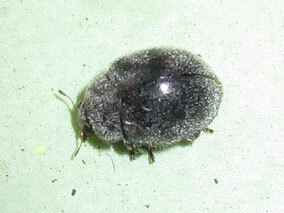 Here is the best of them, but it is a tiny little creature, 5mm long maybe. Yesterday there was a bit of a yelp from the conservatory as my wife spotted first, an empty skin that looked as if it might have previously been inhabited by some skinny, gangly spider, and then immediately afterwards spotted a freshly-emerged harvestman on the underside of a shelf right next to her head. 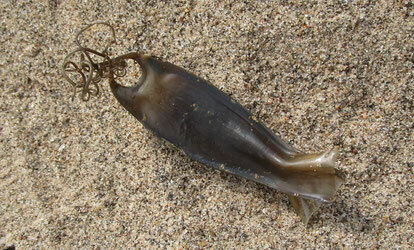 but I caught it and threw it into the flowerbeds in the garden. 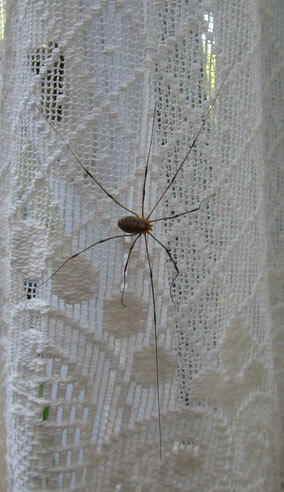 Needless to say, this morning it’s back and sitting, bold as brass, on the conservatory net curtains. 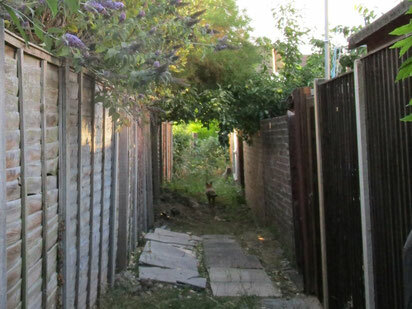 This time I made sure it went over the fence. A green-veined white butterfly got into the conservatory today! 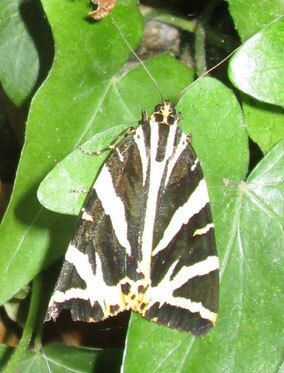 It looks very fresh and new, with creamy-yellow hind underwings. We were also treated to the tiny jumping spider below, an occasional species in our conservatory! 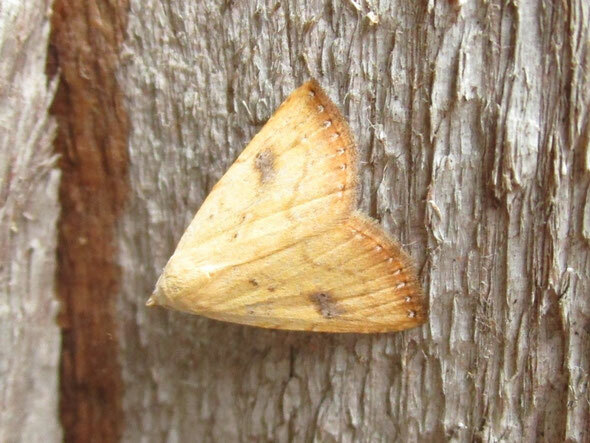 More moths today; I decided to ignore the first riband wave moth I saw as they are pretty common and I photograph them every year; however when I saw the second one, which was a contrasting variant, I photographed it and decided to do the first one on the way back. 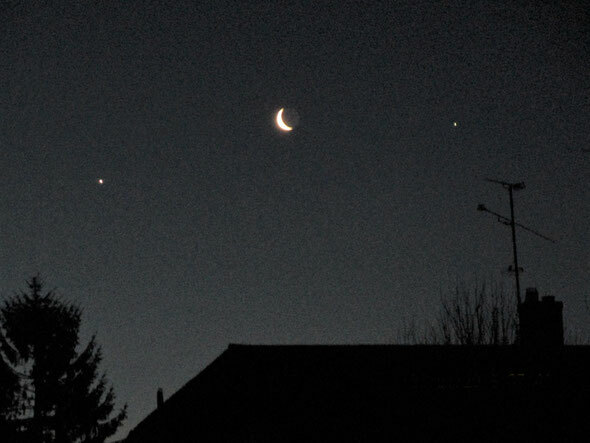 You’ve guessed it though – the first one had cleared off by then, so I was left with just the second variant. Never mind, it’s a nice medium-sized thing anyway. 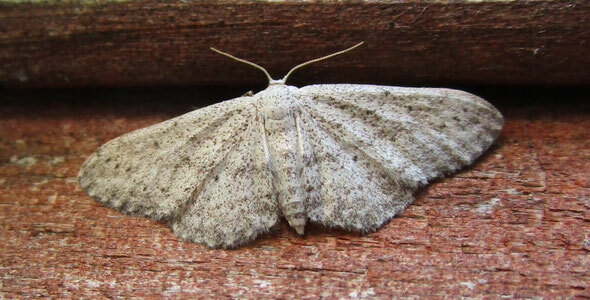 On the other common variant, the two wavy lines are filled in with grey, making quite a striking wing bar. Which I presume is the actual ‘riband’ (or r’ribbon’) in question. I might get one of those later. 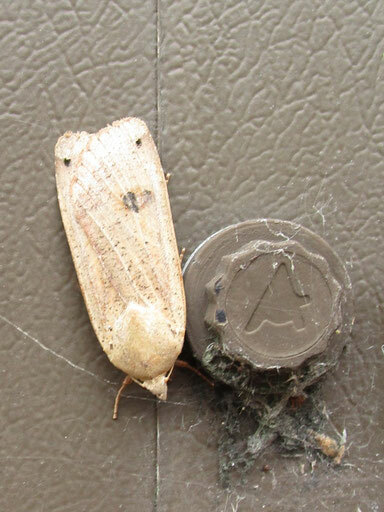 This faded and sorry-looking small moth is a single-dotted wave. 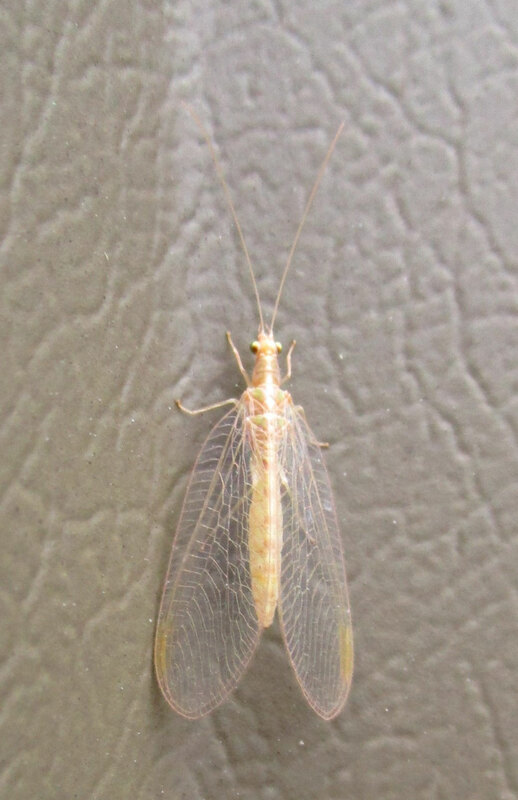 I hadn’t even bothered trying to look this one up because there just doesn’t seem to be enough to get hold of; I only stumbled across the identification while looking for something else on the internet – even when fresh it is not brightly marked. 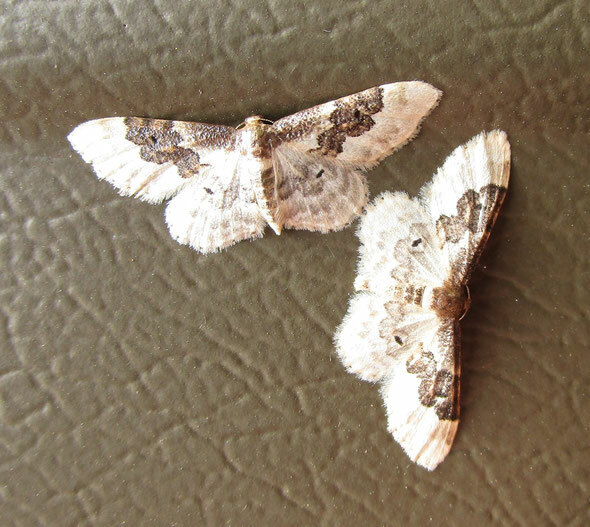 The bottom one has the distinctive profile that marks it out as a pug moth, but they are usually very small, only a couple of centimetres in wing span. 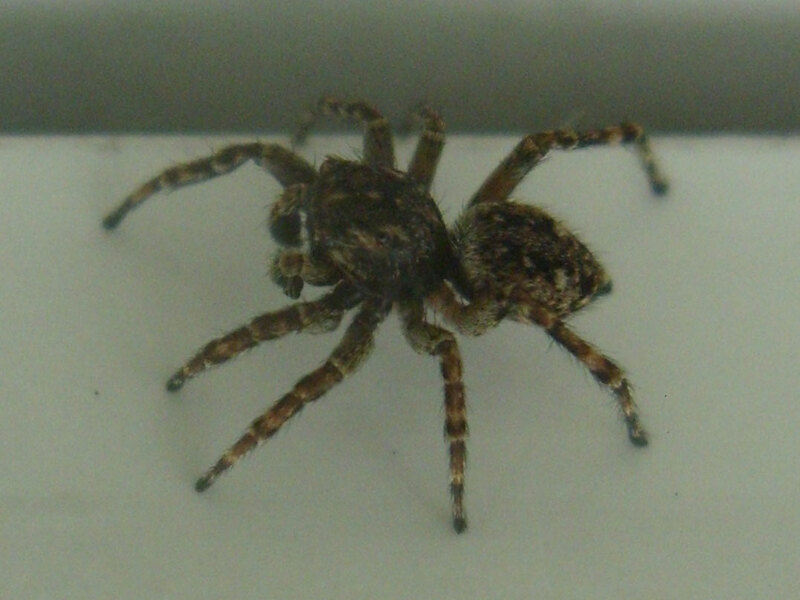 By comparison, this one is prodigious at a good 4cm. 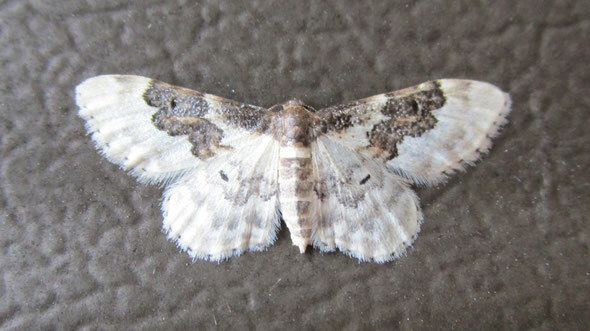 Quite common but ‘rarely seen’ according to my book, this is the bordered pug. 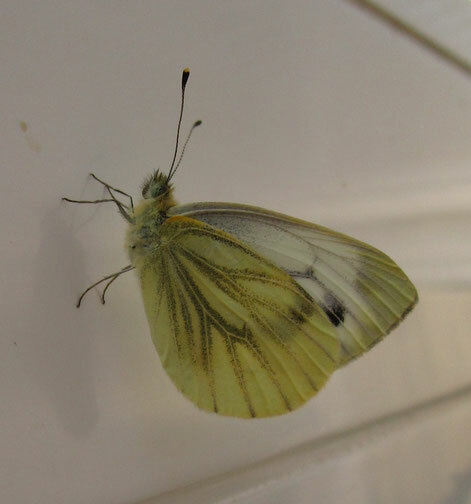 The body is plump, but the wings are almost as flat to the wall as if they were painted on. Below all that is the first spider to hit this page for ages, on my garden shed. 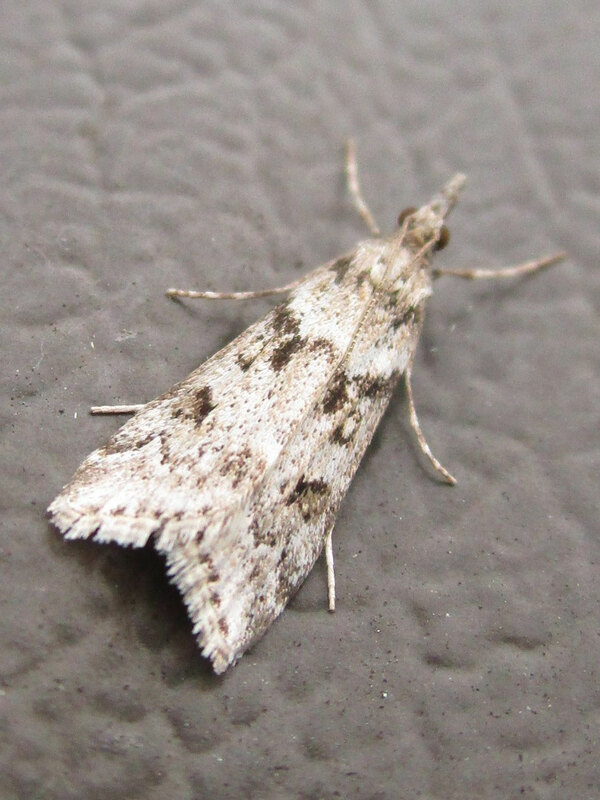 A lot of these little moths have suddenly appeared, and they are dotted at intervals over the outside of the warehouse and the office block. 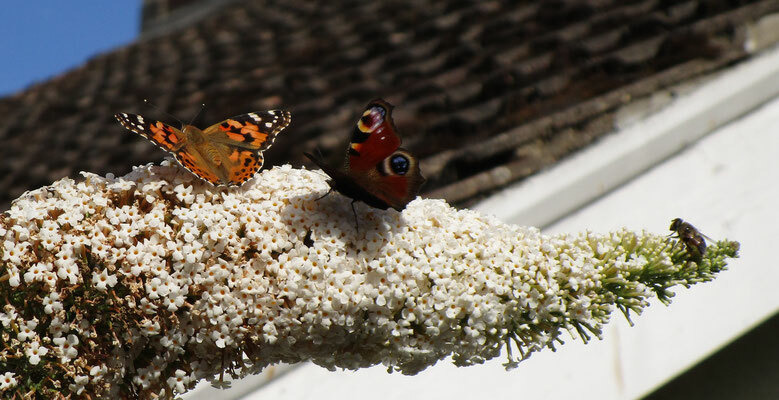 These two next to each other caught my eye though; I thought it was one larger single moth at first! The little micromoth at the bottom is Agonopterix alstromeriana, from the Elachistidae family of micromoths, whose caterpillars are leaf miners on various grasses. I am finding quite a number of tiny ladybirds these days, either in the kitchen or the conservatory. 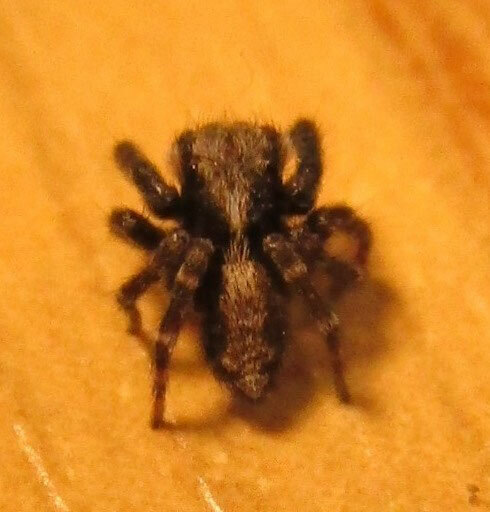 They are quite active and difficult to photograph, and so small that until I get a decent shot and blow it up on screen, I can’t even tell what I’m looking at. However, most of the tiny species, (in the region of 2mm long), are pretty dully-coloured, either plain brown or black with sombre brown markings. 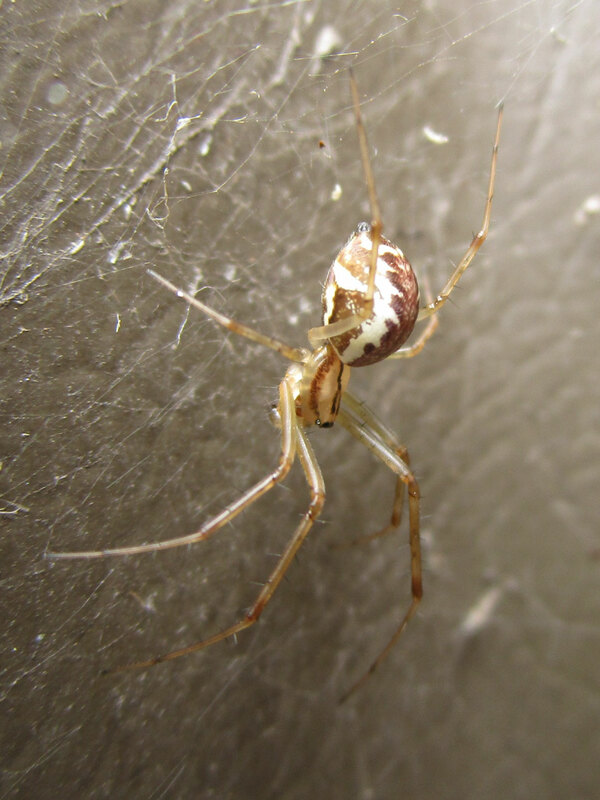 This one turned out to have bright red markings though, more in line with the larger species, and I’m positive I have never seen one before, so I’m pretty excited! 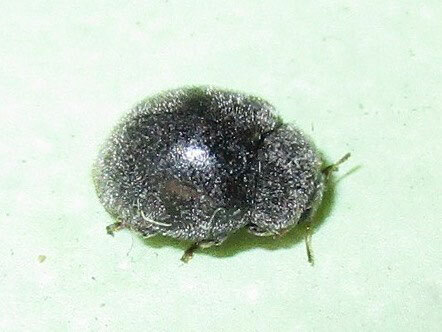 I have no way of identifying it other than via the Ladybird Survey, so I have fired off some photos to them, to see what they come back with. As usual, my photos are dreadful on this scale. 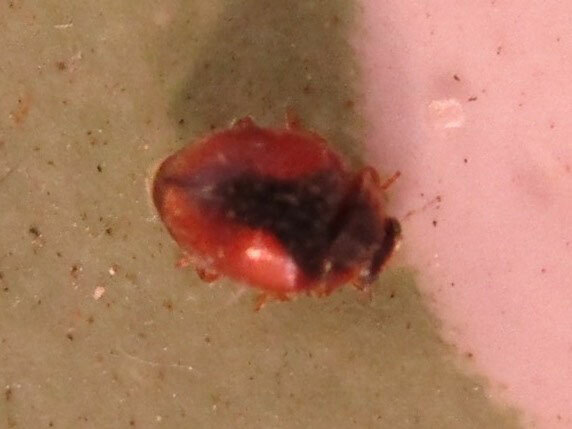 Helen at the Ladybird Survey suggested Nephus redtenbacheri as a possible ID. Do we have any details of location and/or habitat? 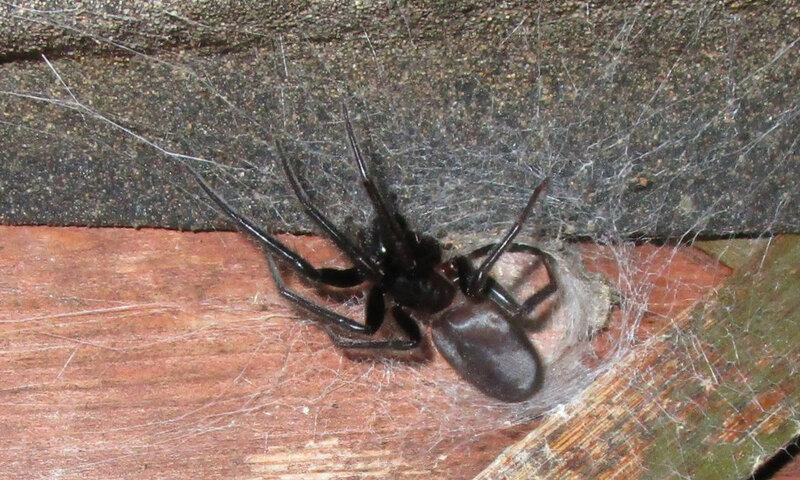 I would say that this is a variety of Scymnus interruptus and I don't think it's S. suturalis (because of black T shape being too thick, overall appearance too red). 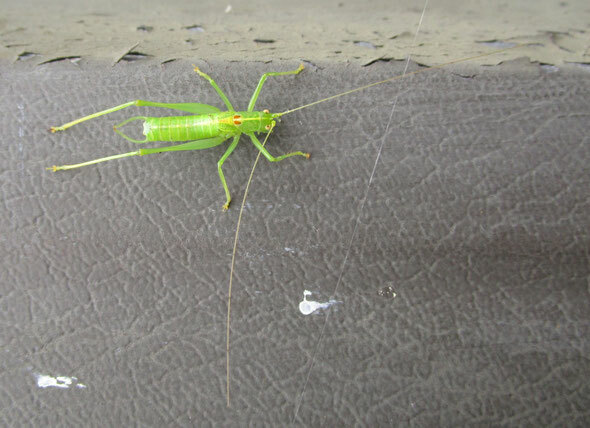 But Nephus Redtenbacheri is not a species that I find, so Richard could we ask your opinion? I'm happy to rule out redtenbacheri - the colours are too bright and the red seems to at least reach the epimeron, which it doesn't in the Nephus. 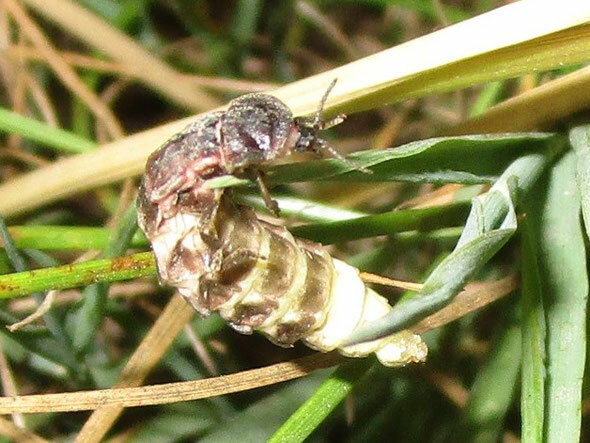 For similar reasons, I don't think it's Scymnus suturalis. 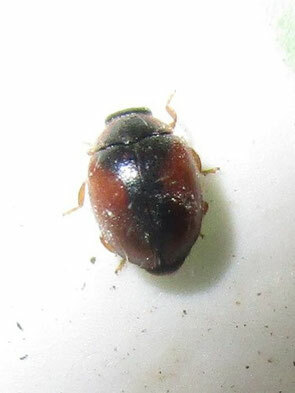 Scymnus interruptus does have colour forms like this (Mark Telfer has found them in East London, though they seem scarce elsewhere compared to the standard form), but S. limbatus is very similar (albeit slightly less red) and I wouldn't be happy splitting those two from these photos - need to see the underside, ideally of a specimen. So my ladybird remains officially unidentified! 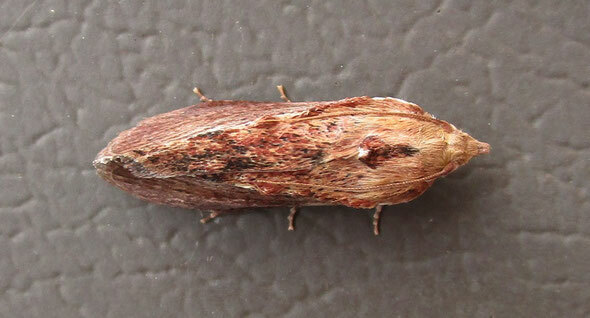 But I shall take it as my 6th species of the year. 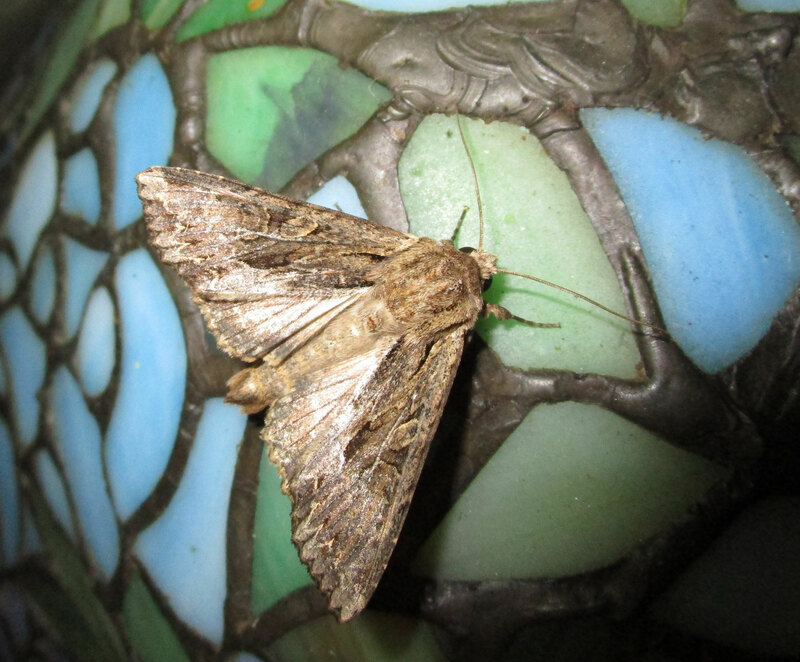 This moth got into the conservatory tonight. 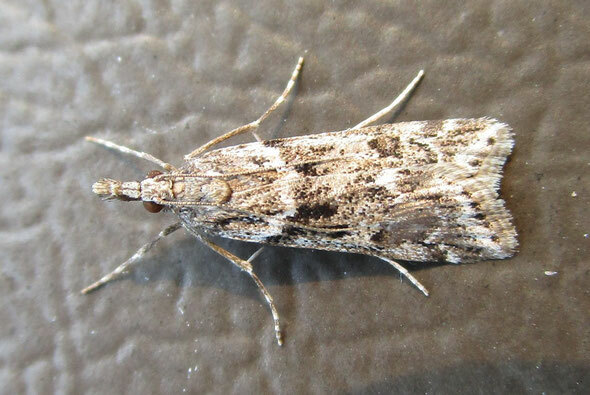 I thought it was the standard Silver Y, but it turned out to be a similar species, not easily identifiable – dark arches? Clouded brindle maybe? Yesterday one of these moths appeared on the outside wall of the office block at the factory, but it had gone by the time I went down to photograph it. Then this morning I came in and there were two there, including this lovely specimen. This light green species is the small emerald Hemistola chrysoprasaria. Chrysoprase, by the way, is a light green semi-precious gem. 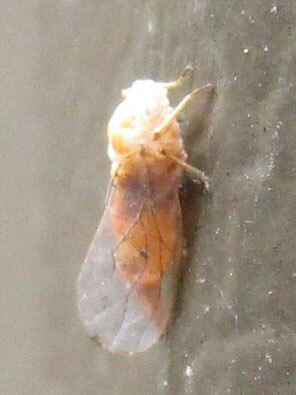 Here is another, similarly small-sized moth on the outside of the shed. I pored long and hard over my various moth books but without gaining any positive ID. 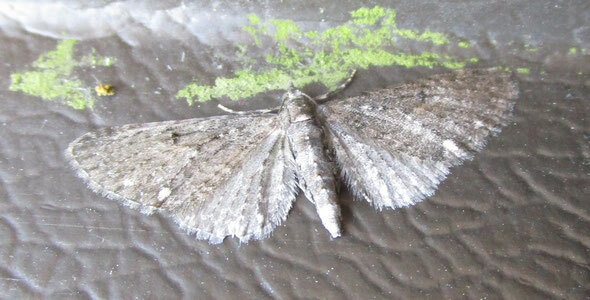 I believe it is one of the wave moths.